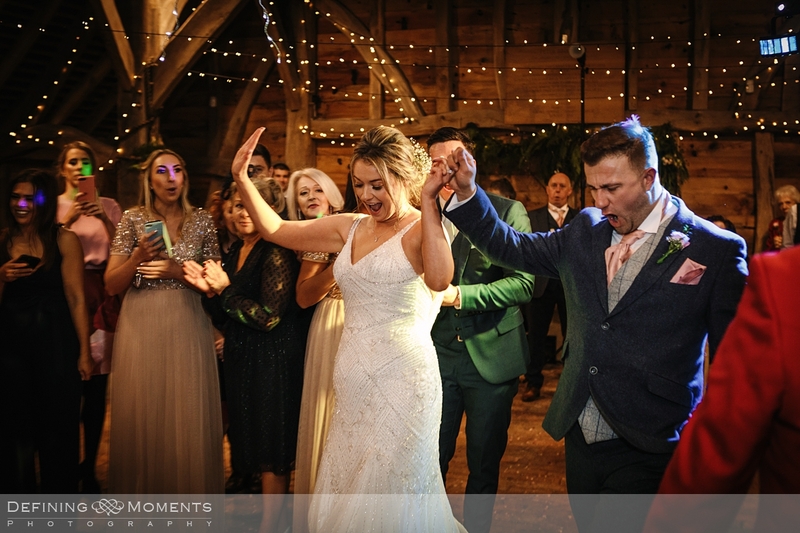 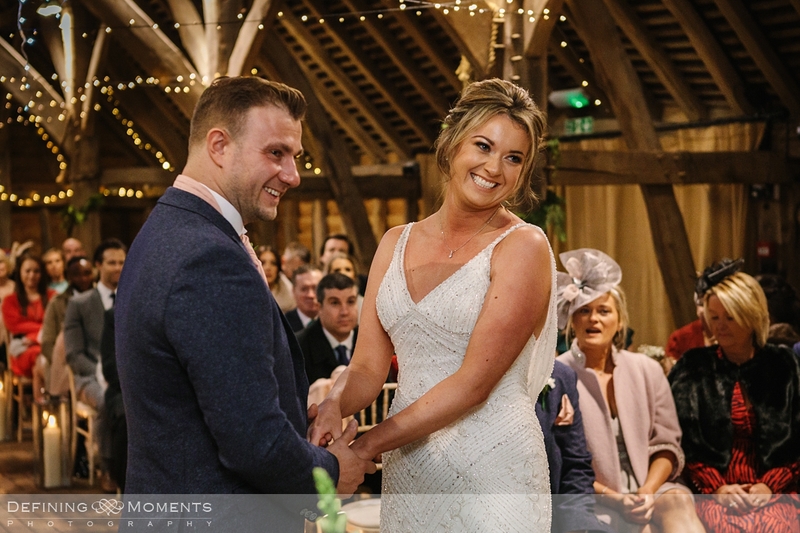 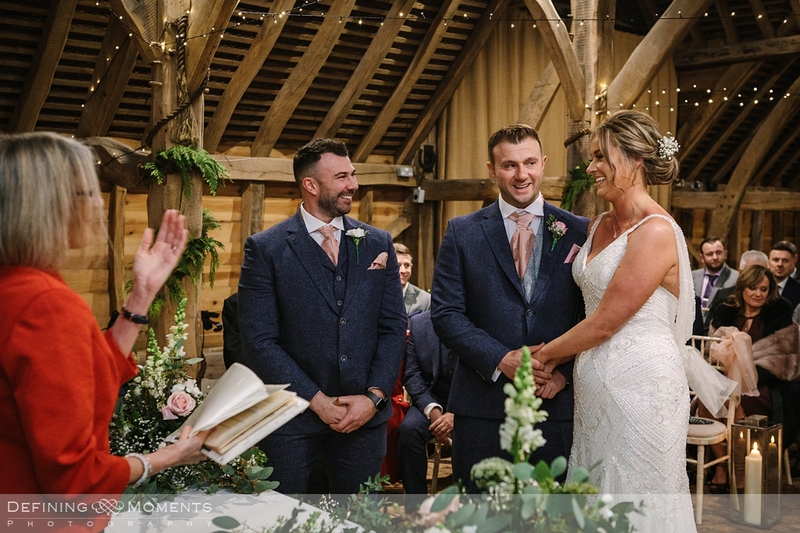 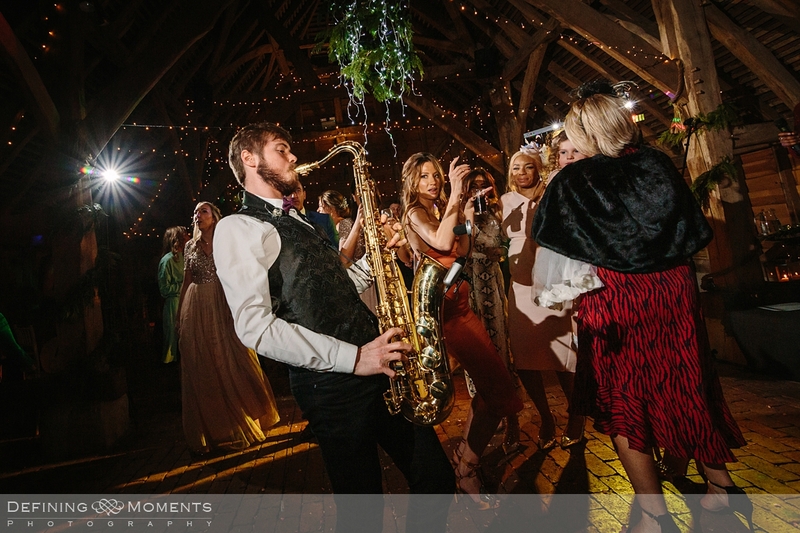 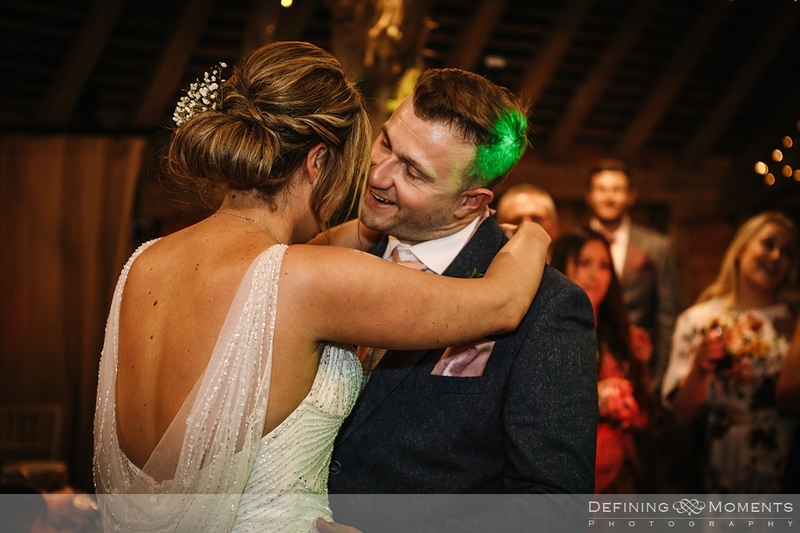 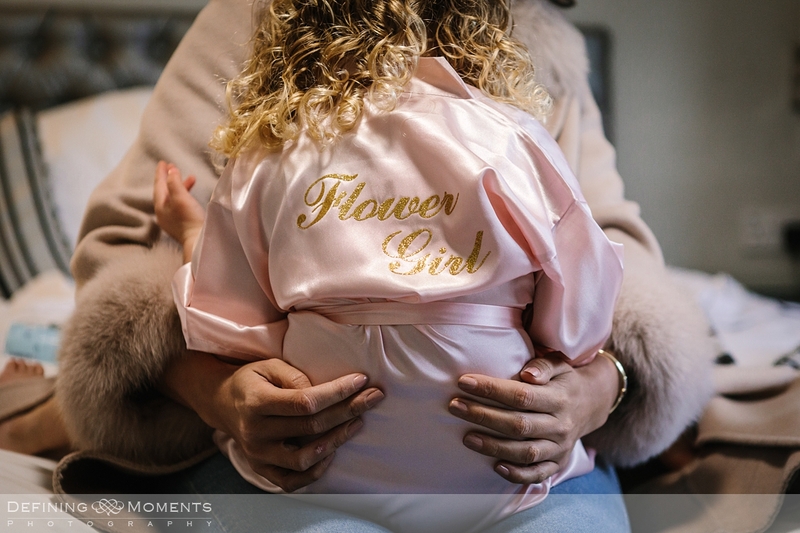 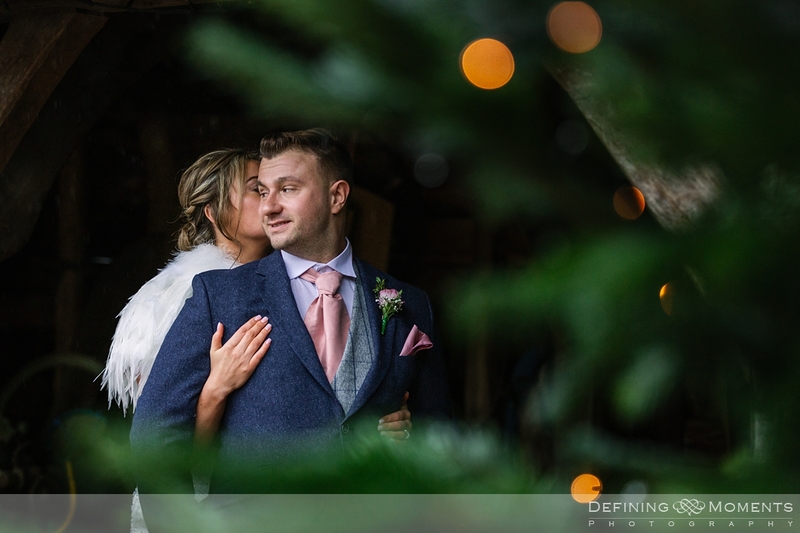 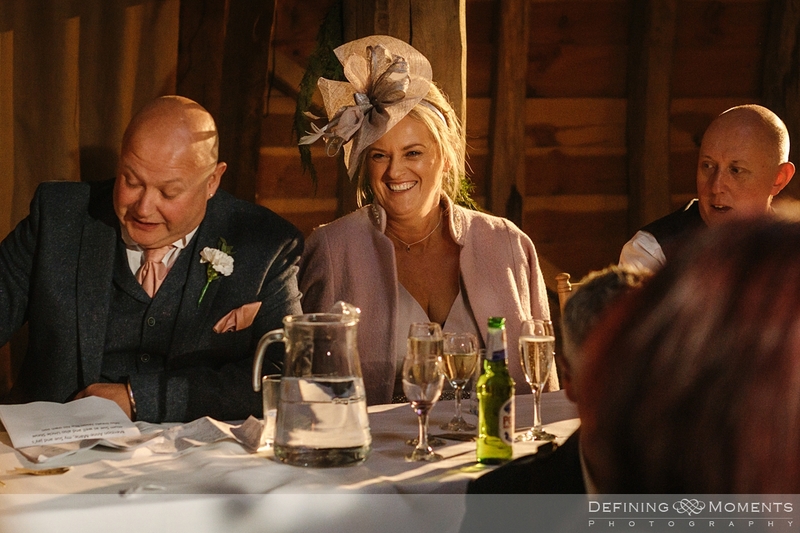 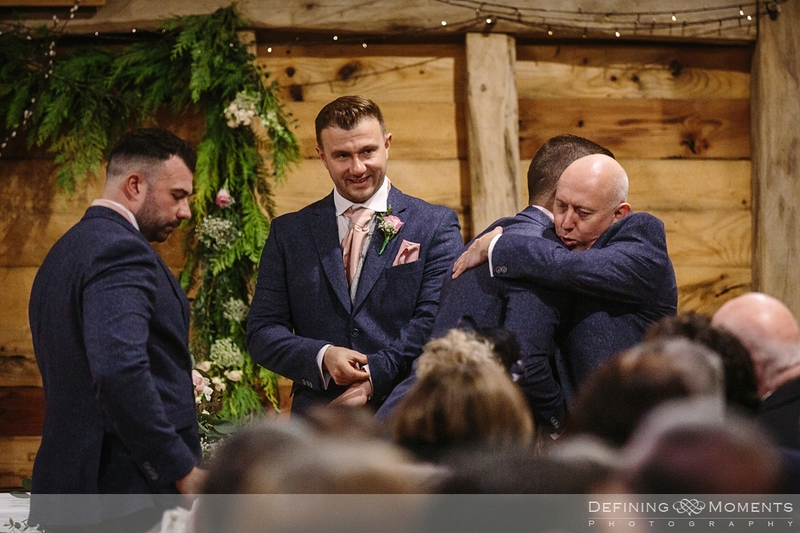 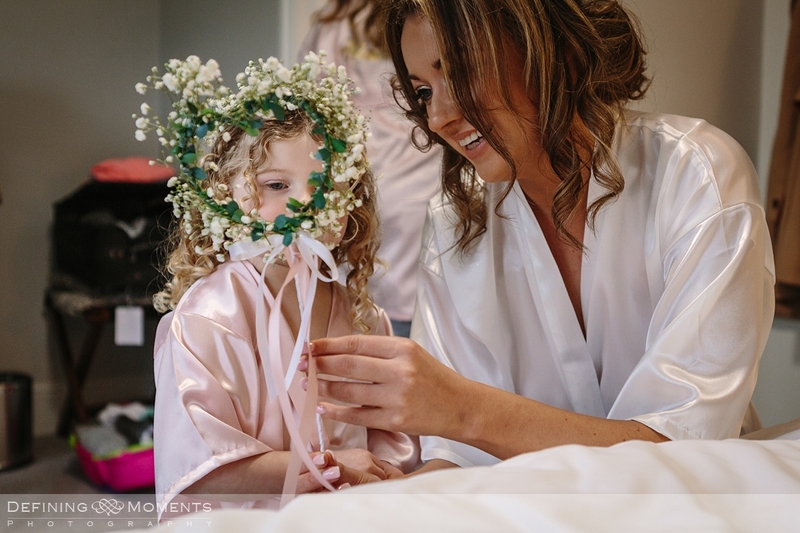 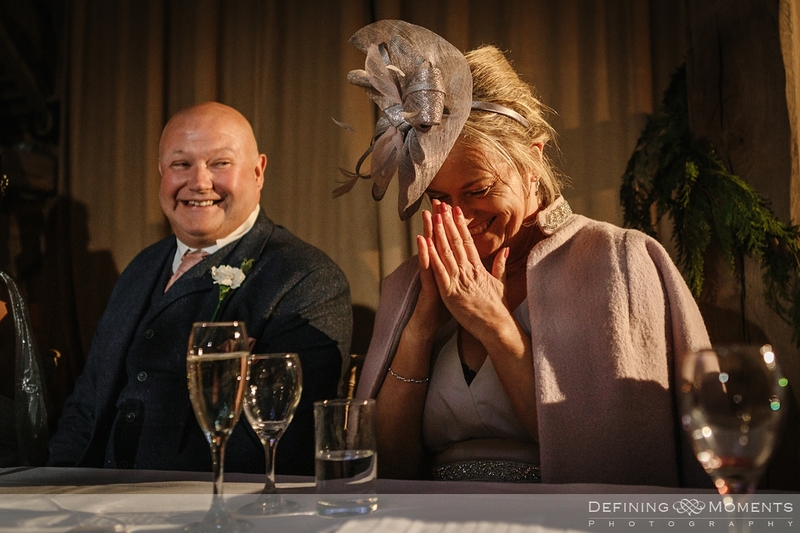 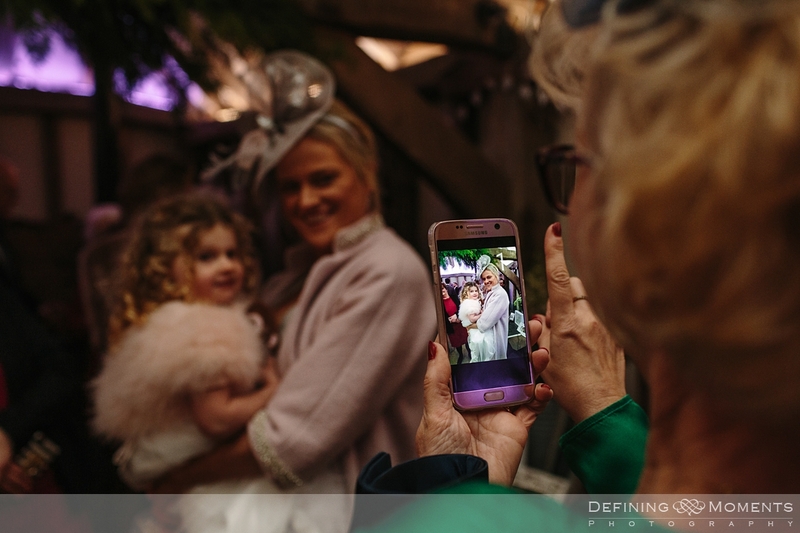 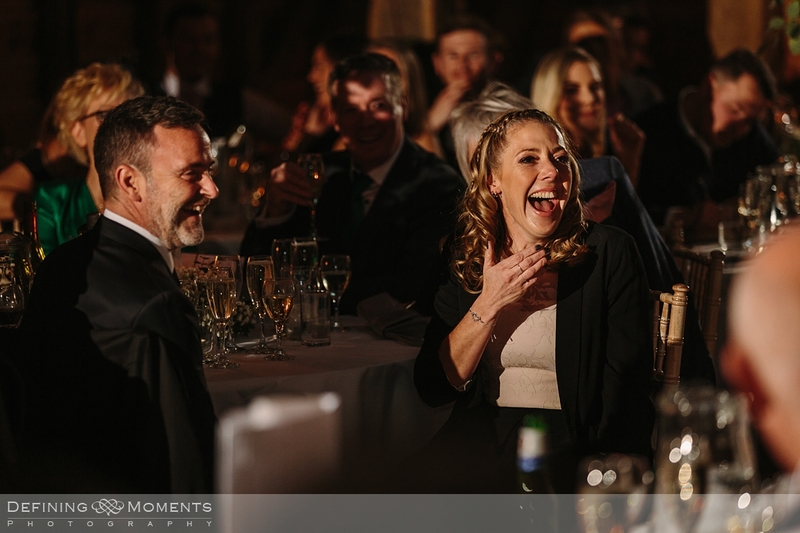 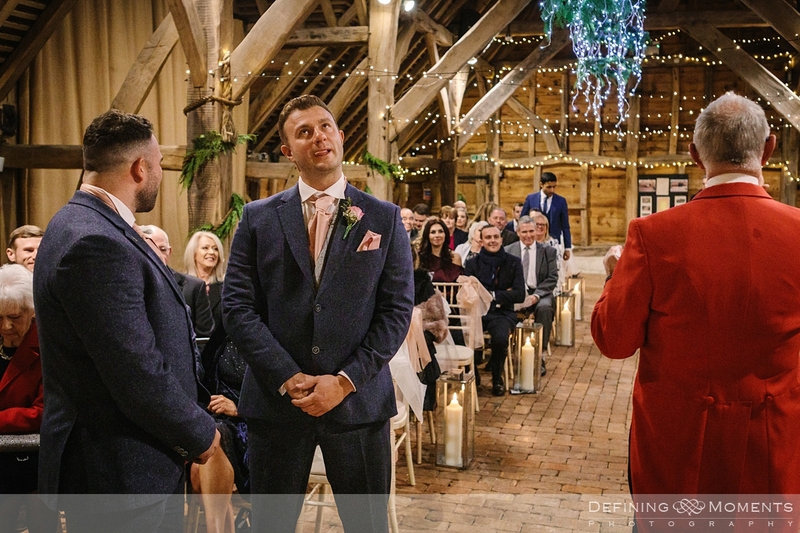 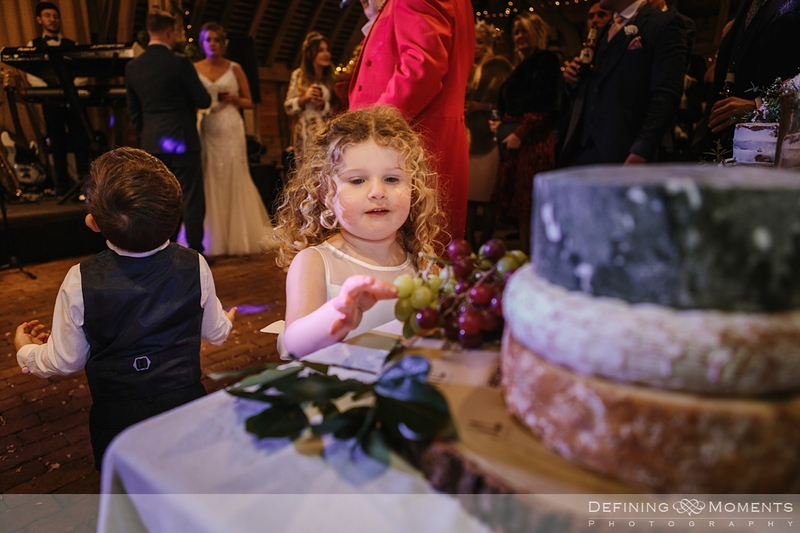 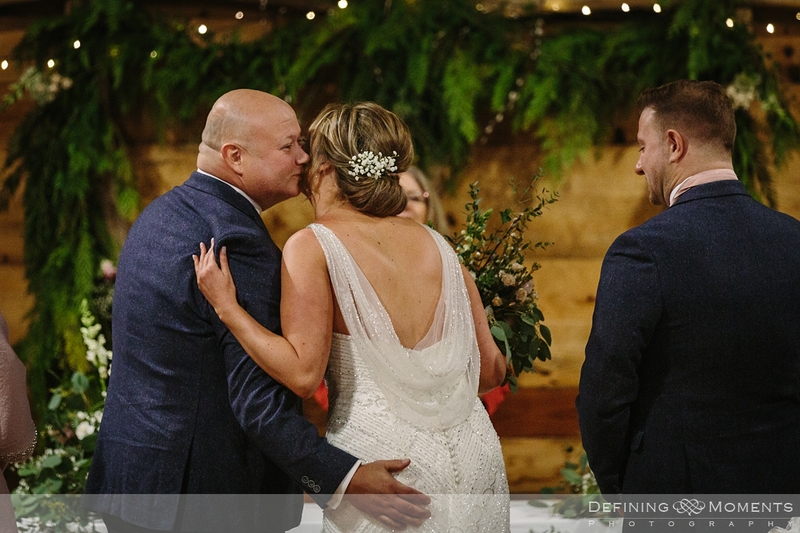 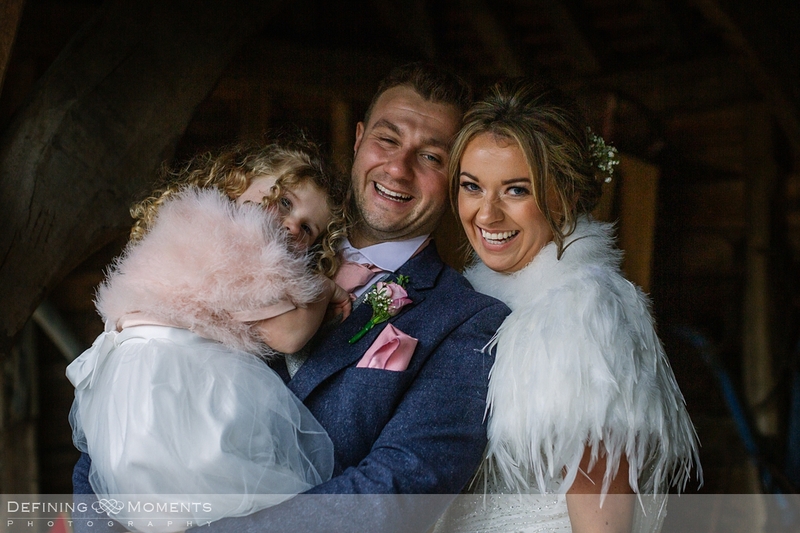 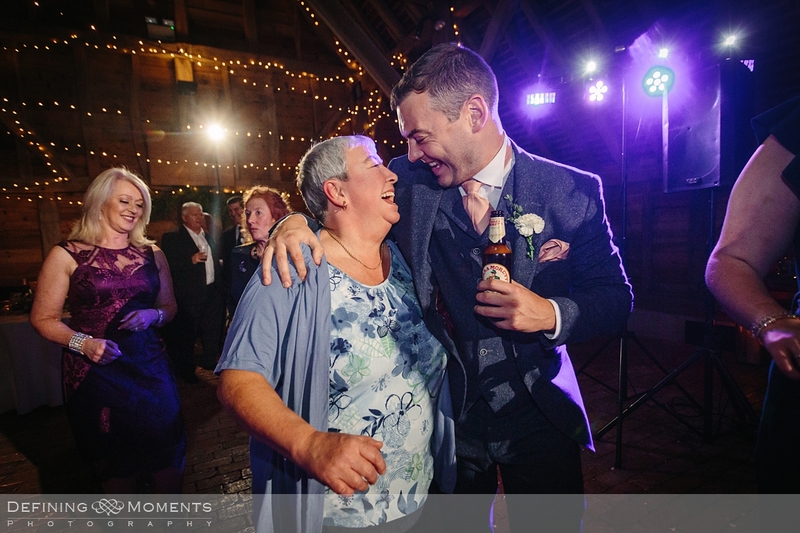 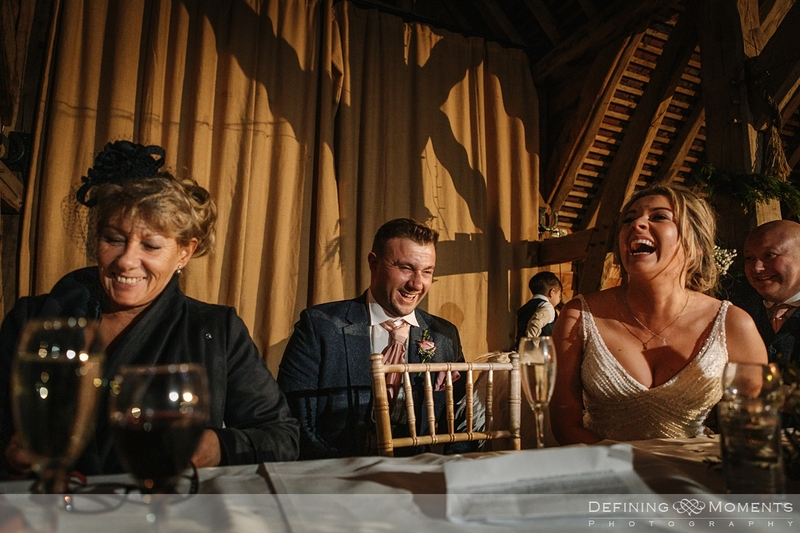 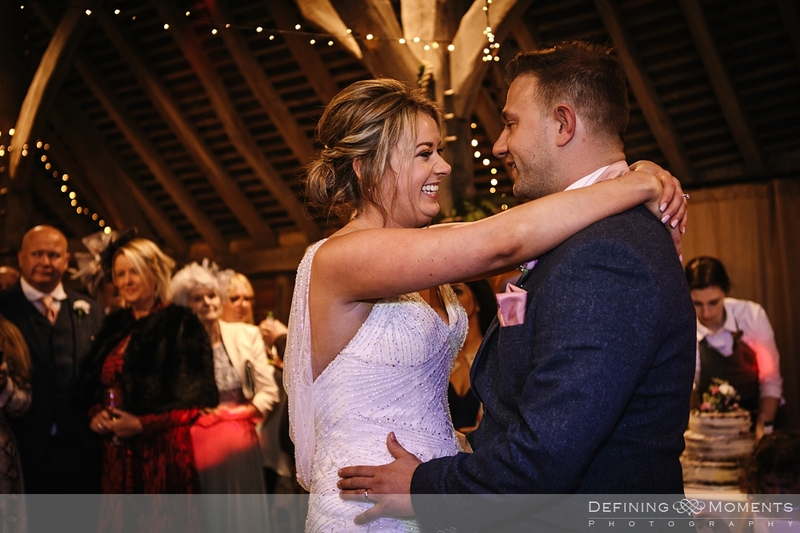 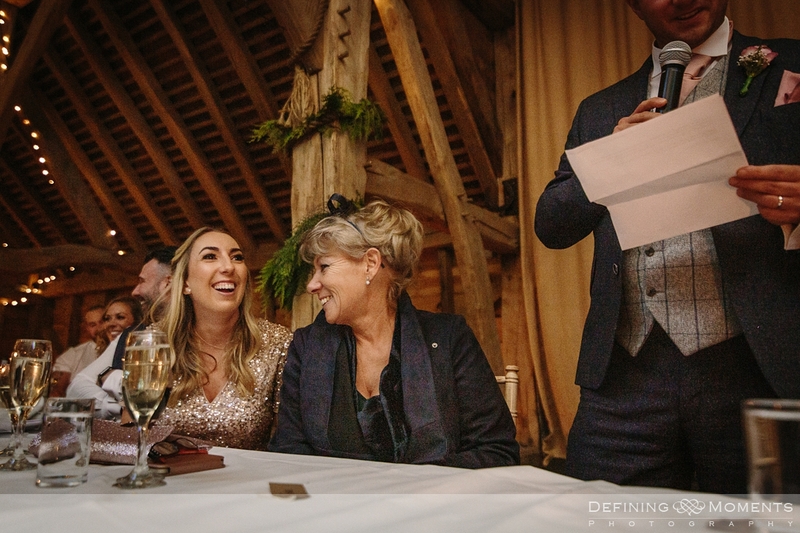 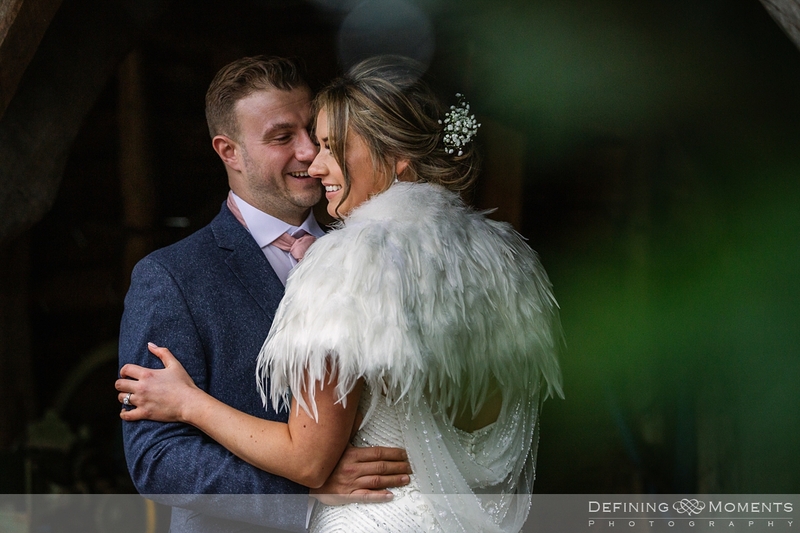 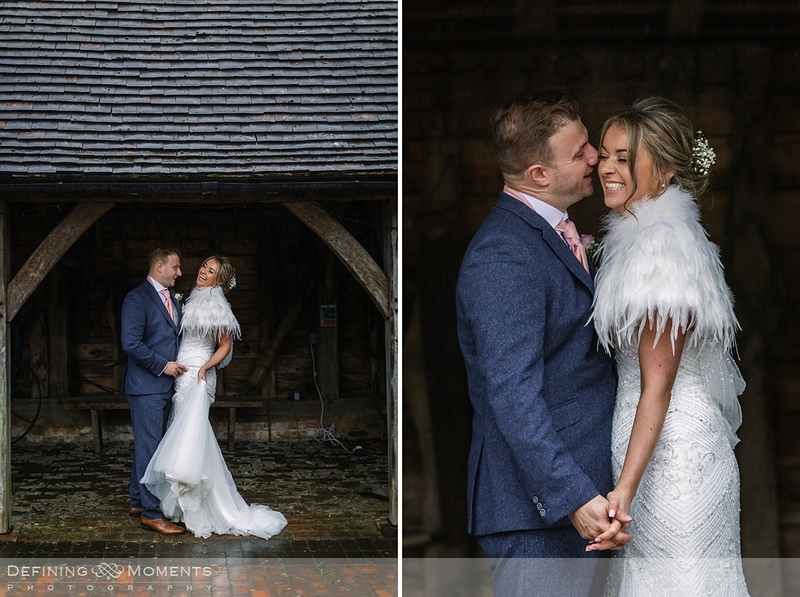 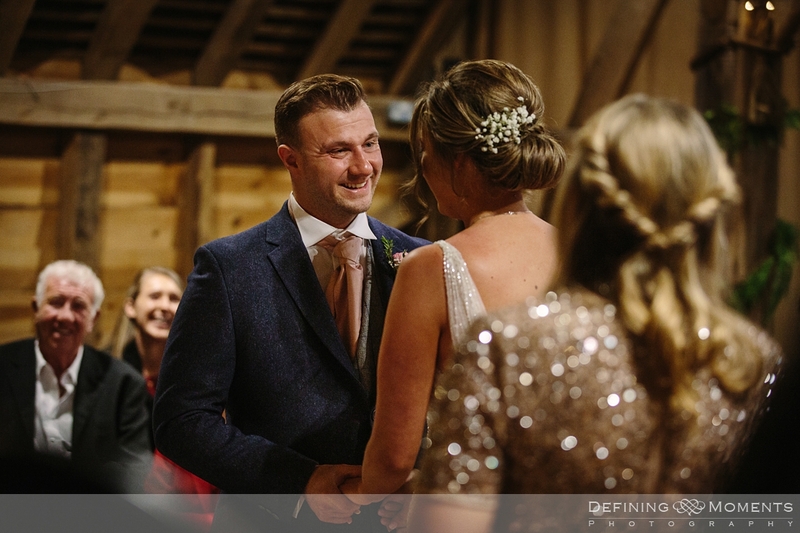 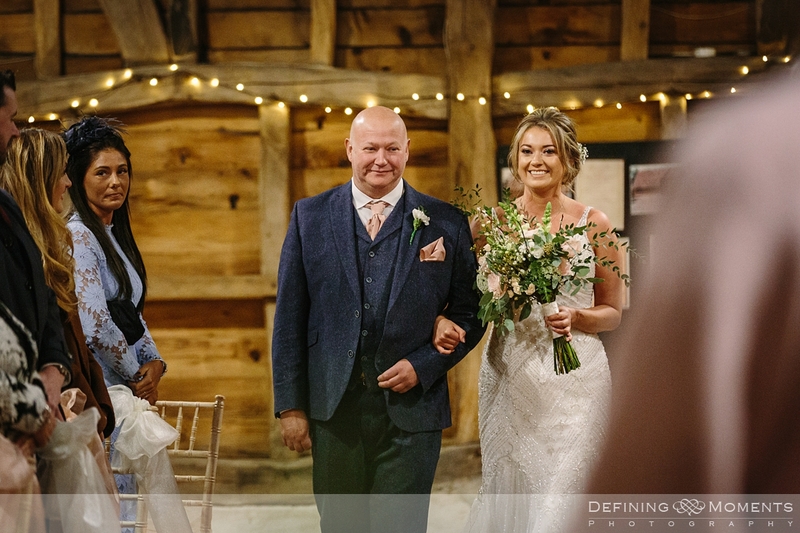 The opportunity to create this wonderful Gildings Barn wedding photography story was one that I had been hoping for since a while as a documentary wedding photographer Surrey. 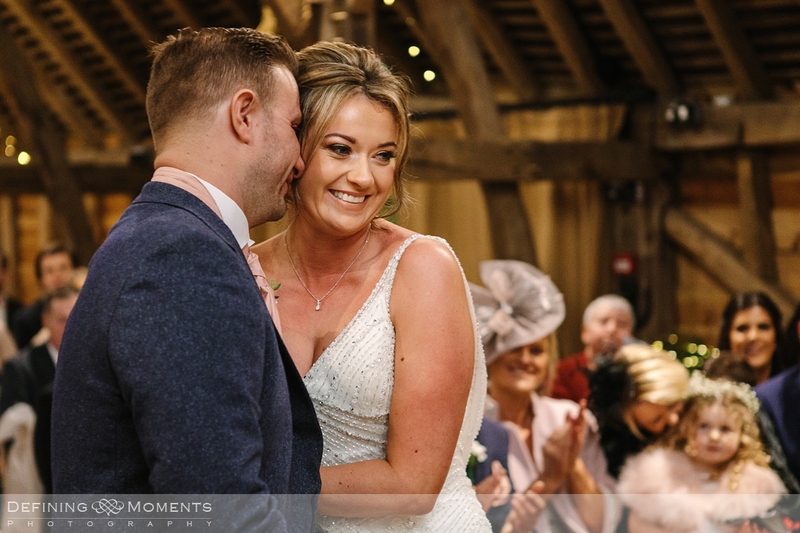 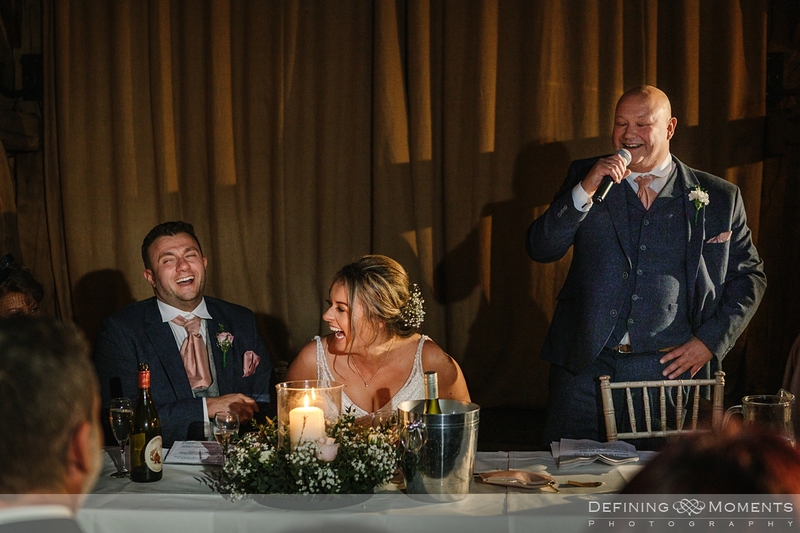 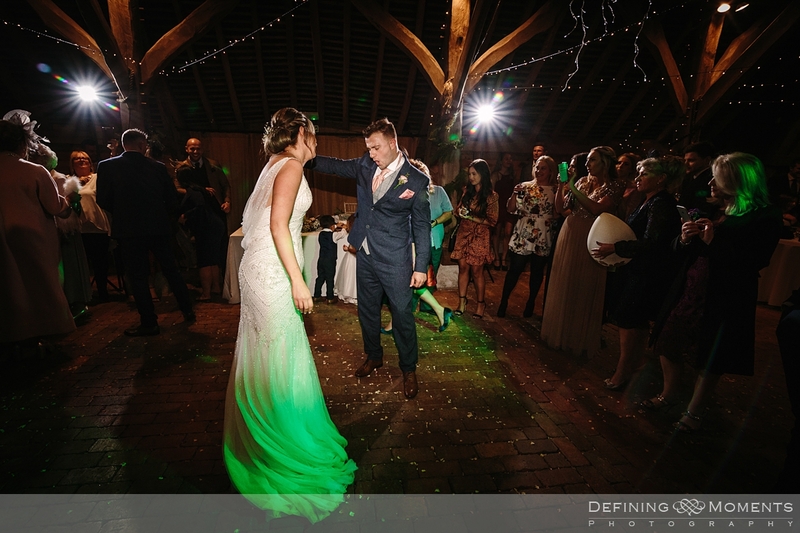 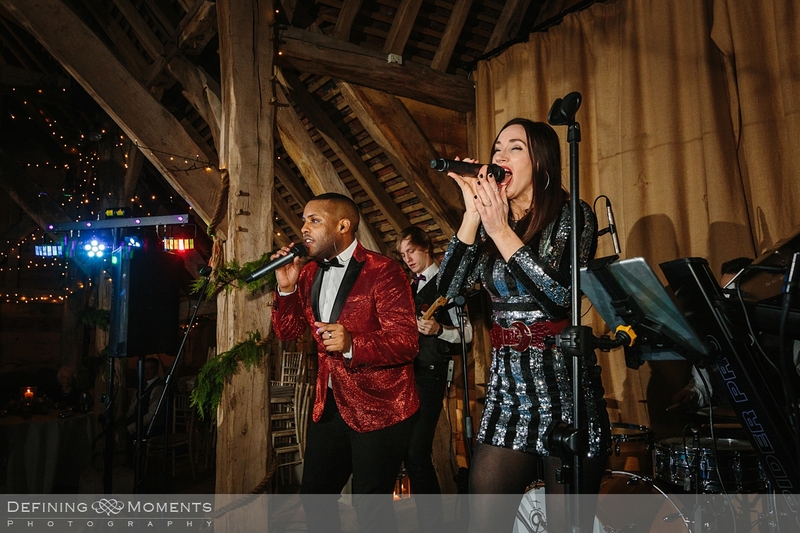 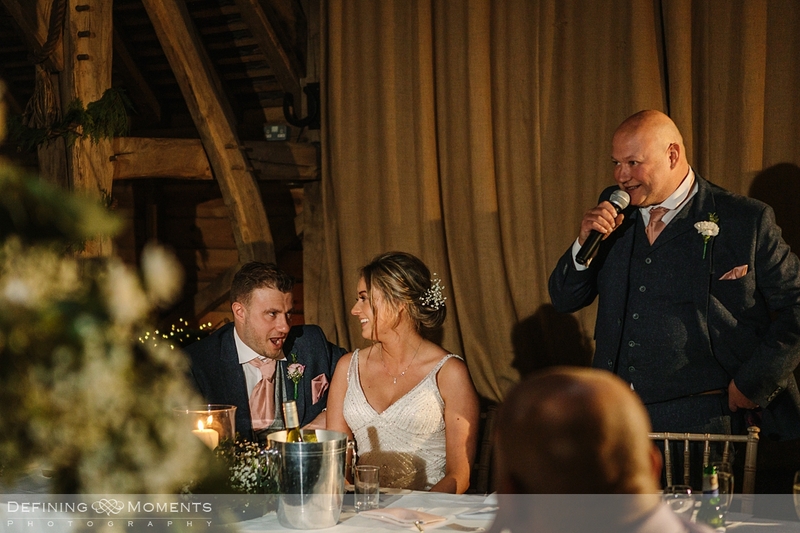 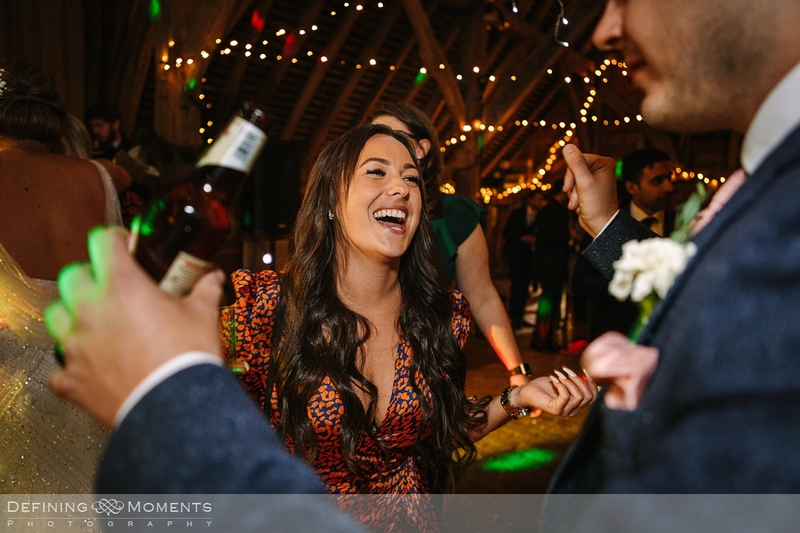 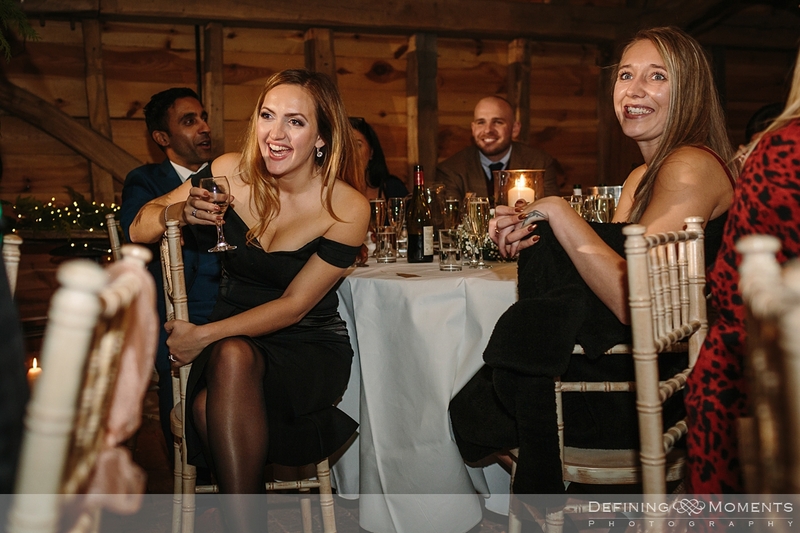 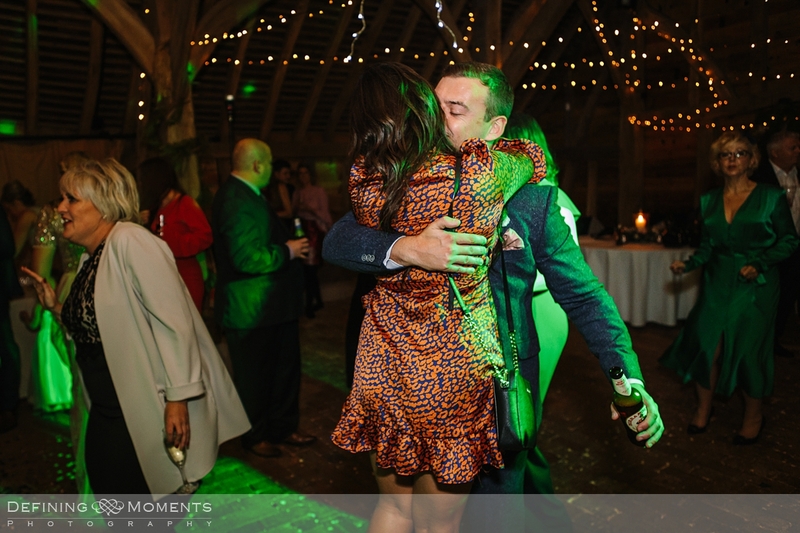 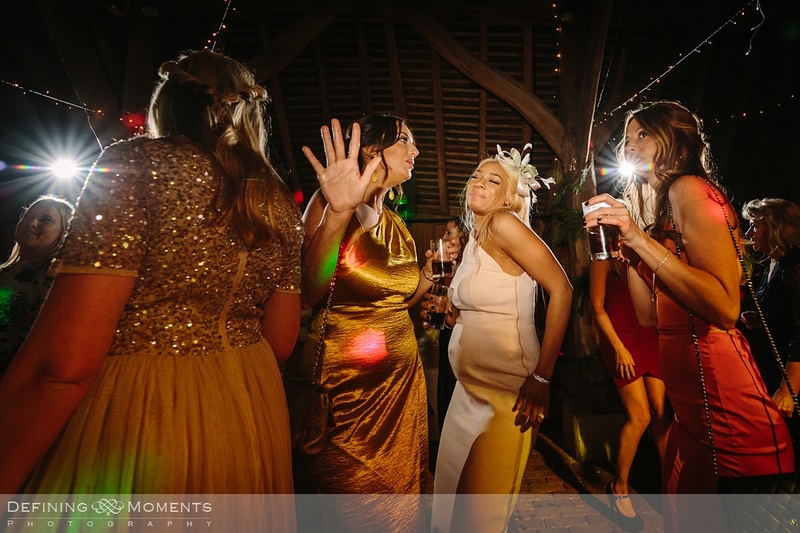 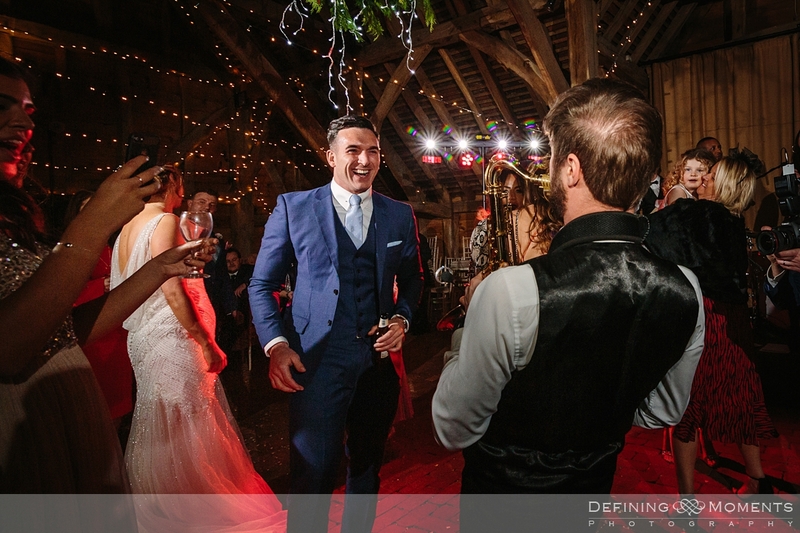 Gildings Barns is one of the nicest wedding venues in Surrey that I have had the pleasure to visit, and the perfect setting for – you guessed it! 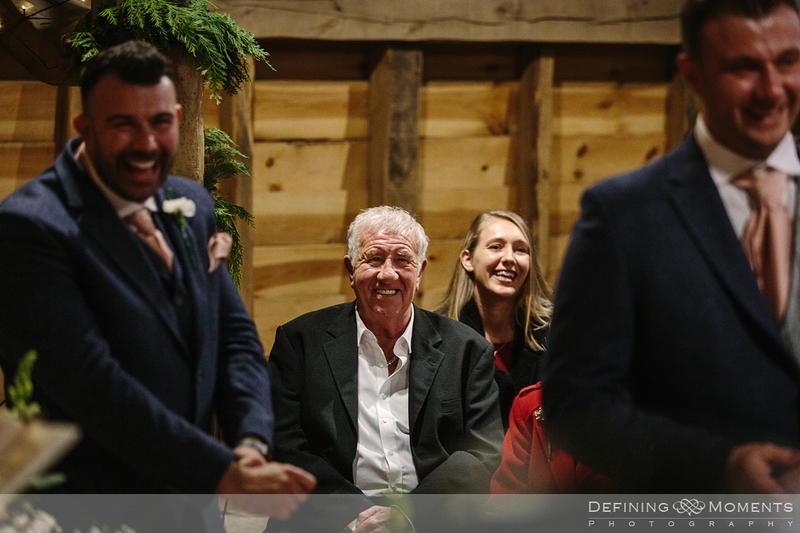 – a rustic barn wedding. 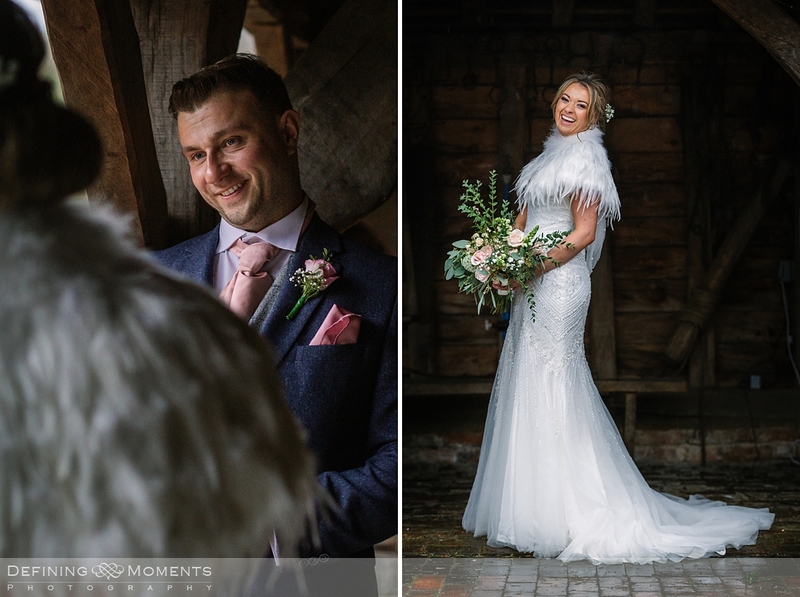 So when Jason & Lora found me through the Fearless Photographers directory for the South East of England, we arranged for a personal meet-up soon after. 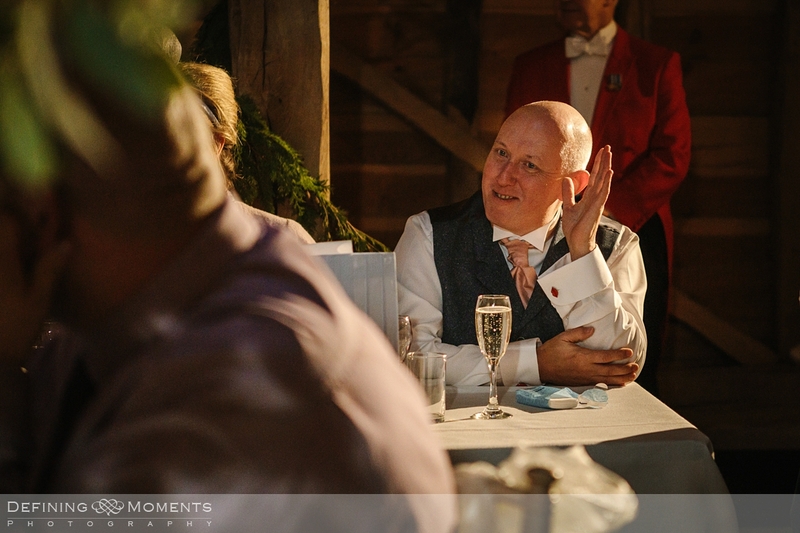 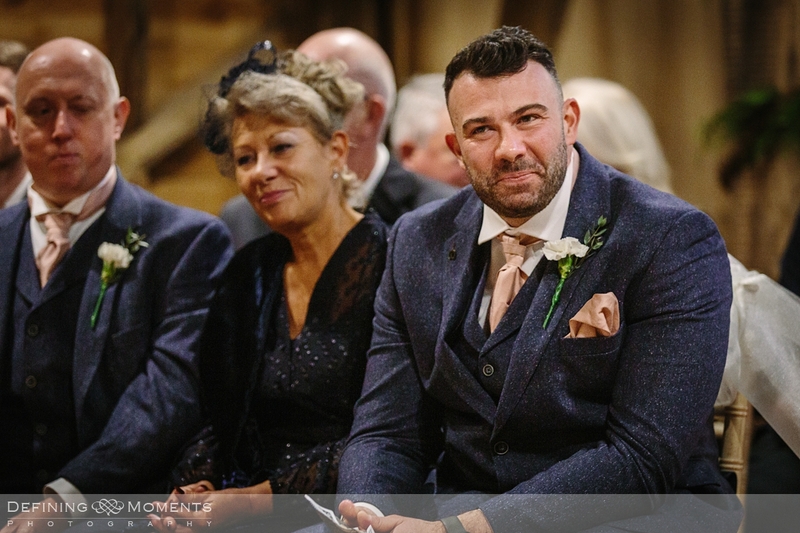 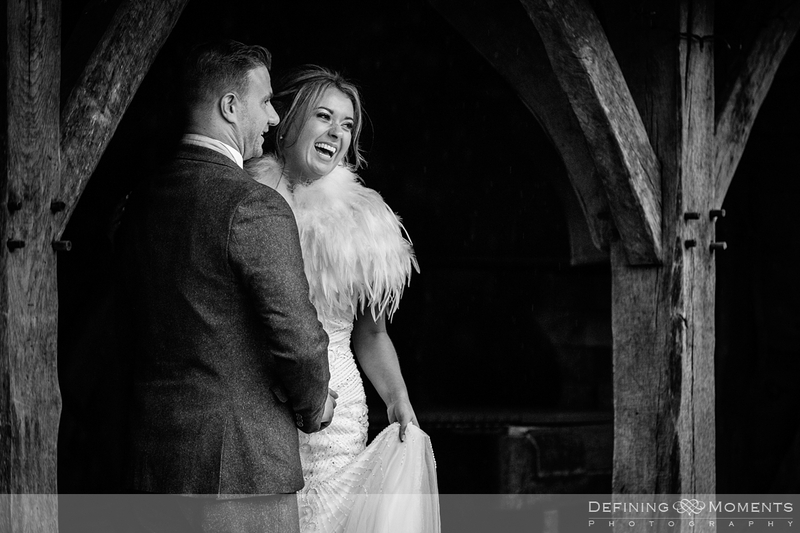 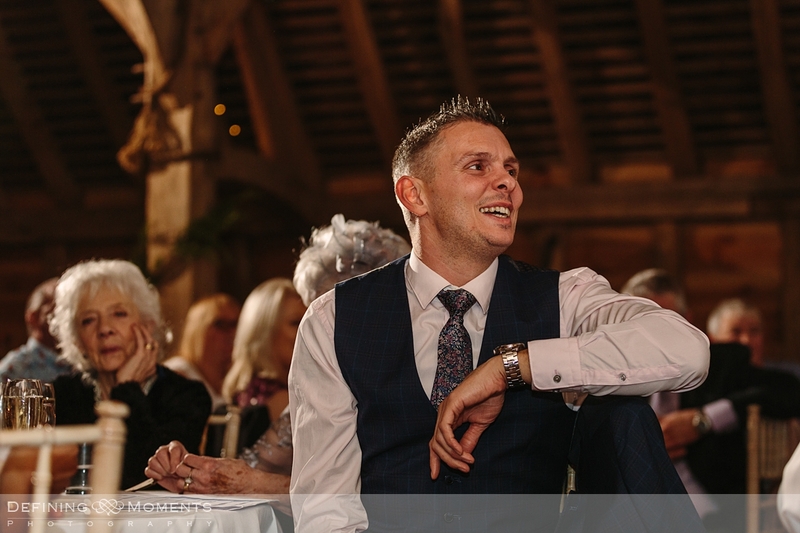 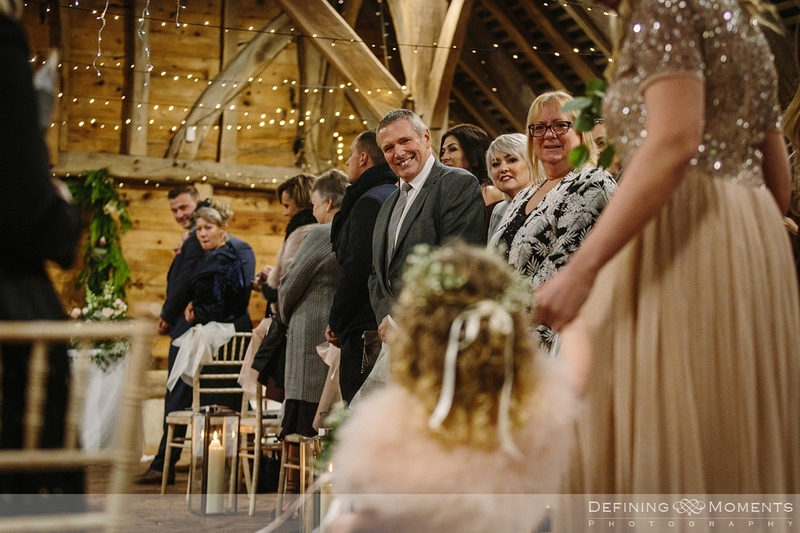 It soon became apparent that my documentary style approach to wedding photography was exactly what they were looking for and their Gildings Barn wedding venue is a wonderful setting for story-telling wedding photography. 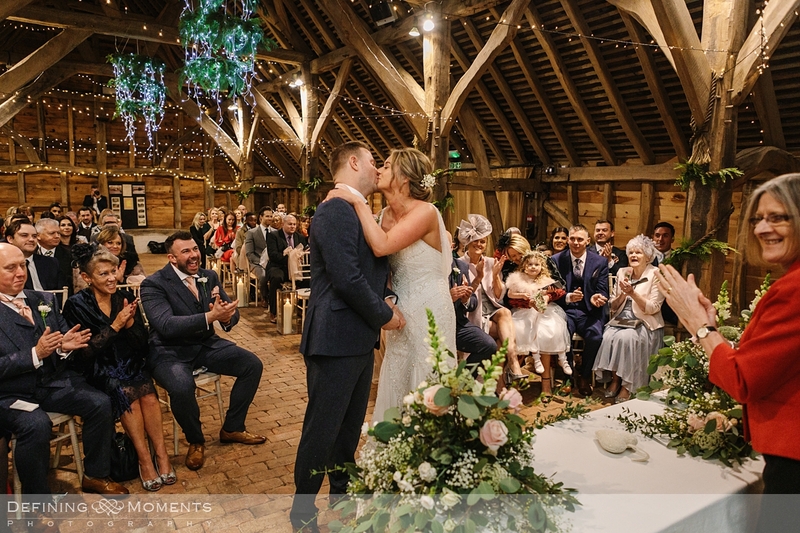 It’s oak barns are situated near Dorking, set in the wonderful Surrey countryside and surrounded by woodland giving plenty of photo-opportunities. 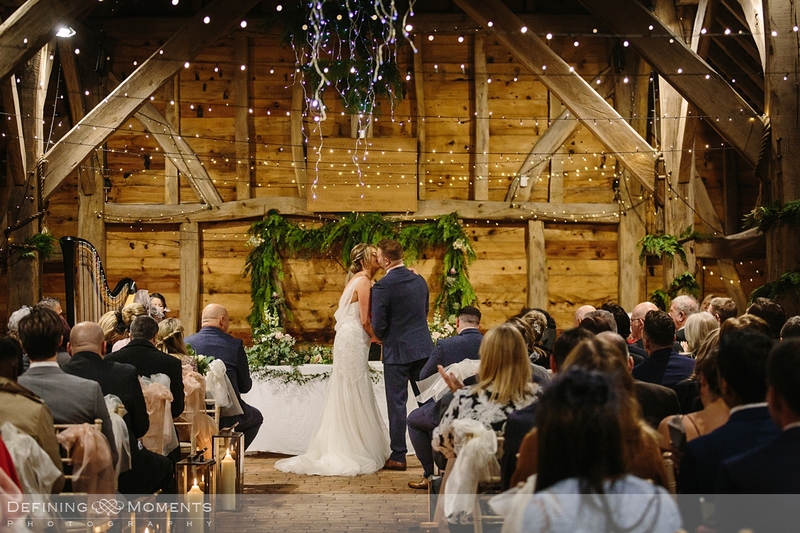 If you are thinking about a rustic barn wedding, don’t hesitate to contact them soon as it is a very popular (and officially approved wedding venue so you can have your civil wedding held here): 2019 is already fully booked! 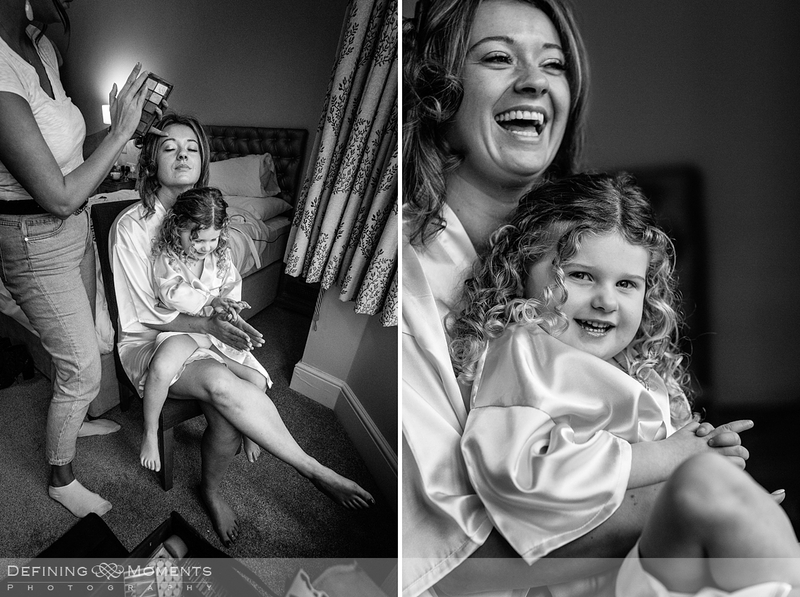 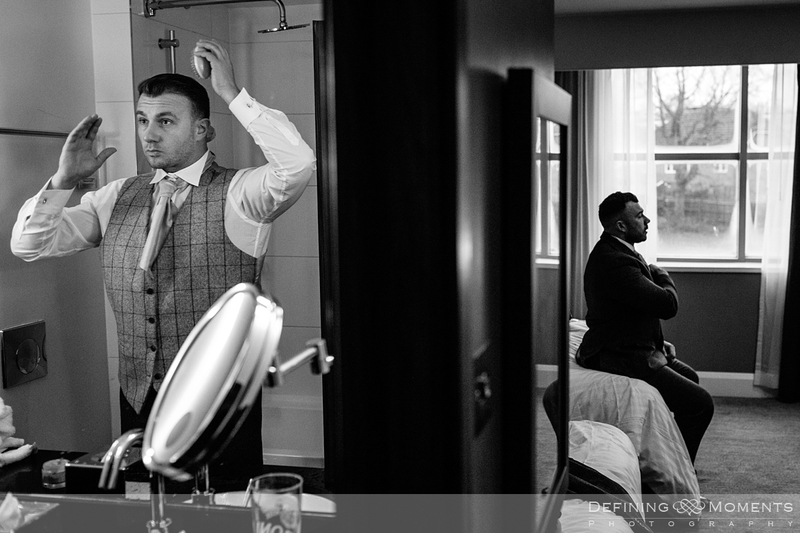 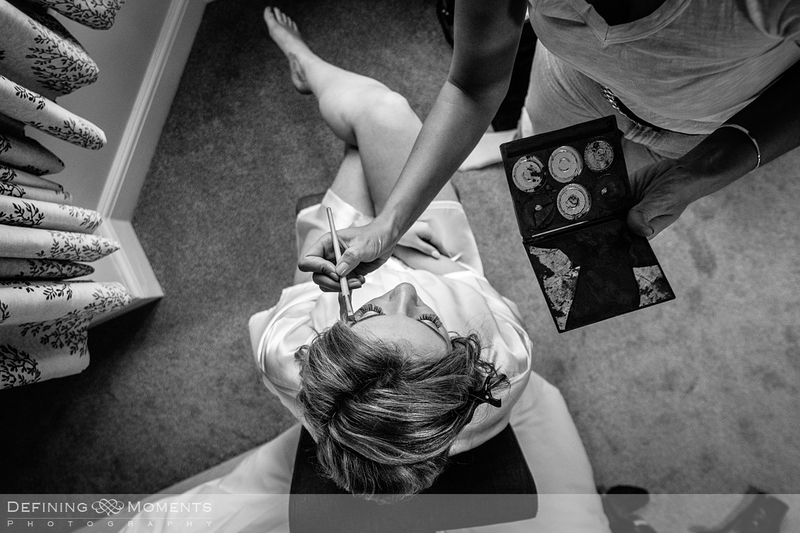 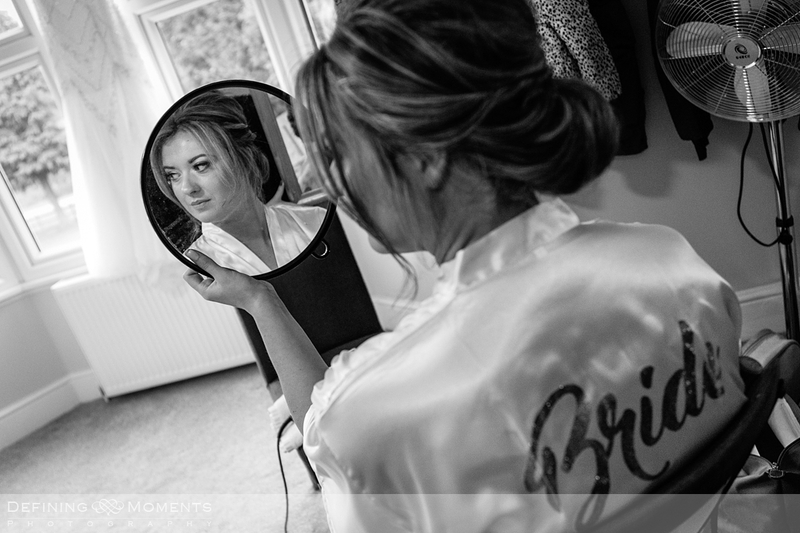 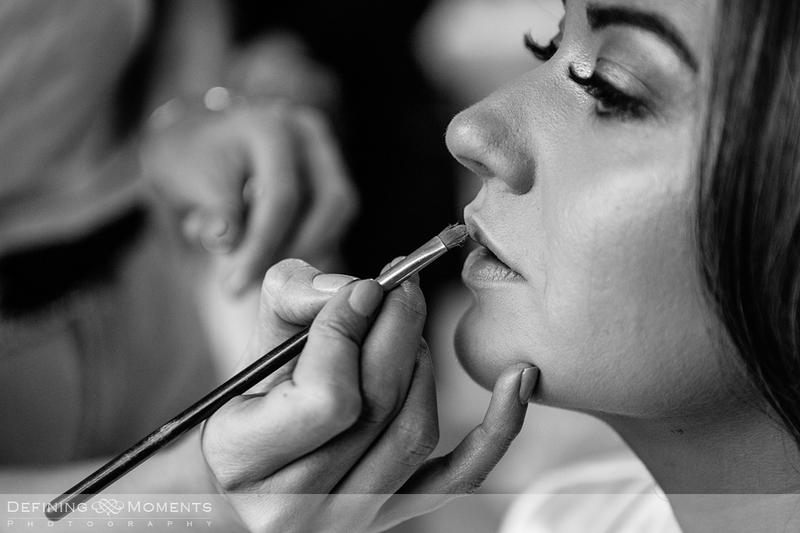 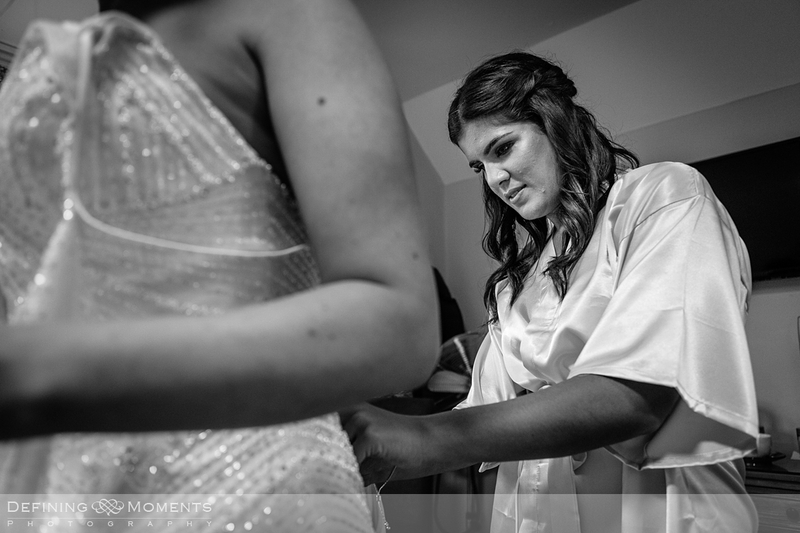 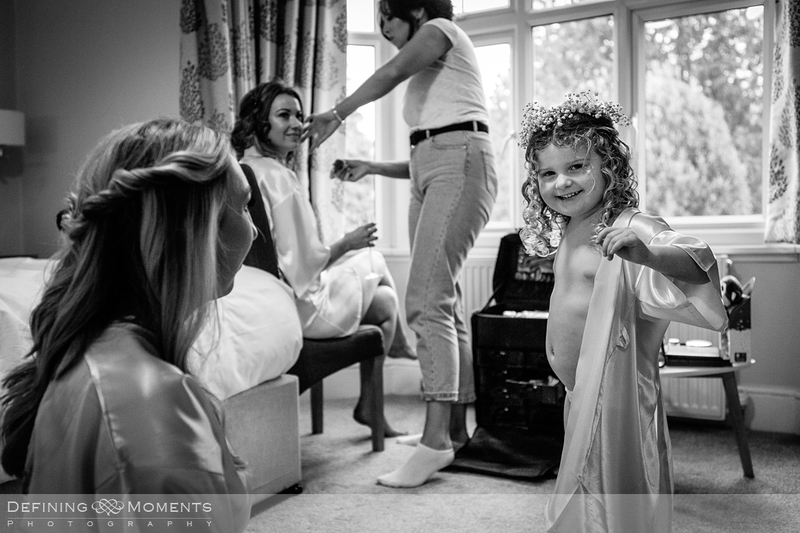 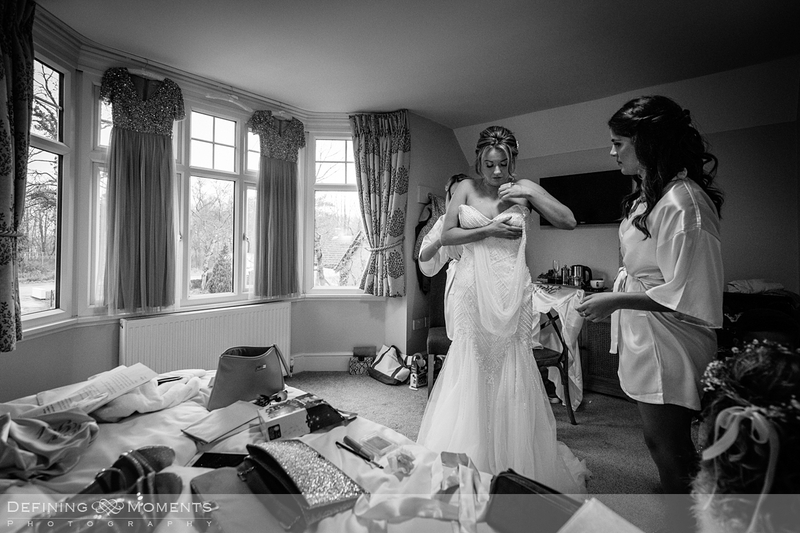 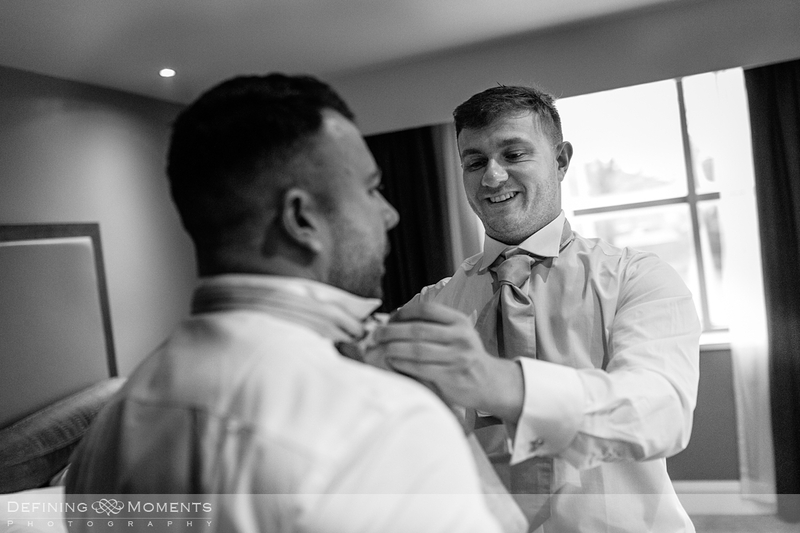 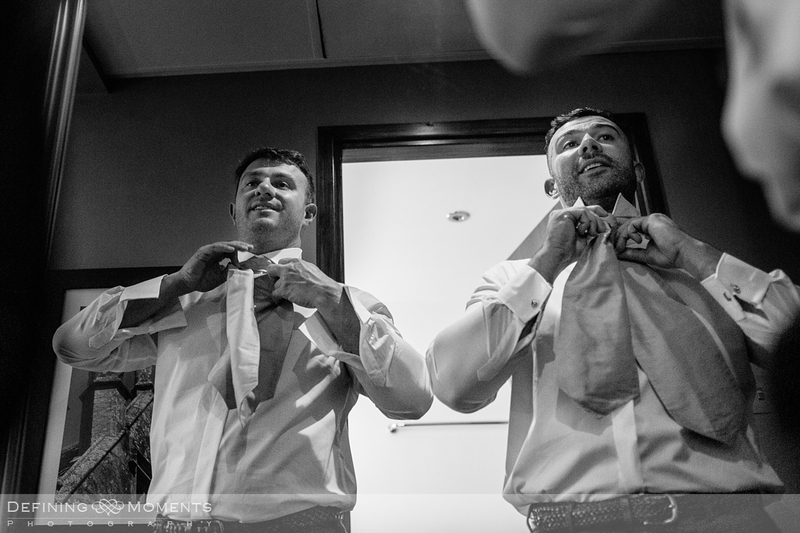 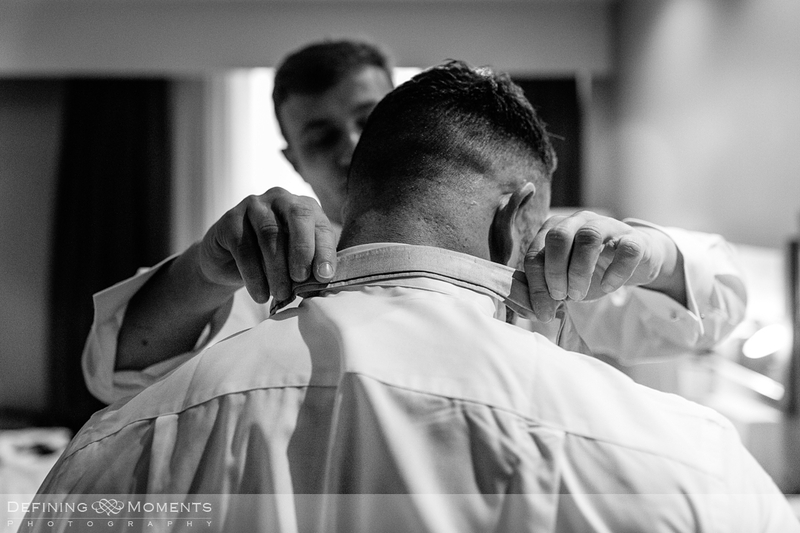 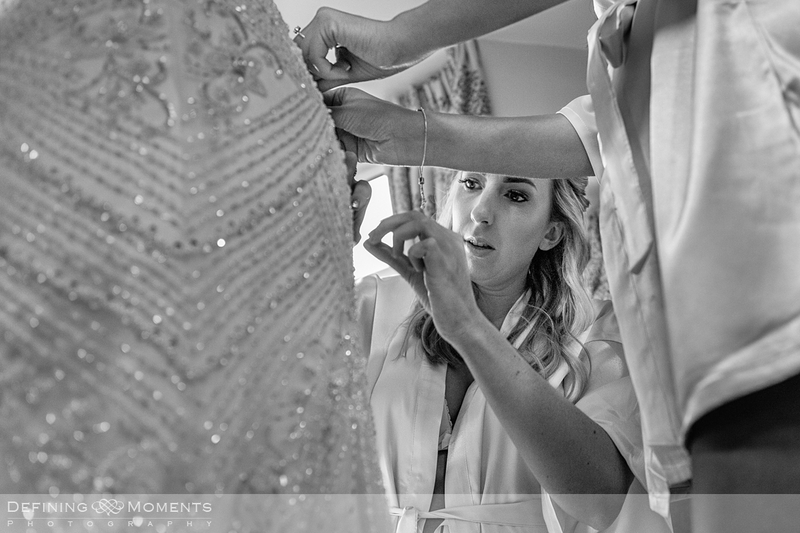 Our documentary photographic coverage of the wedding day started with bride & groom preps, each in different locations so having a second photographer (aka ‘second shooter’) booked for the day was perfect! 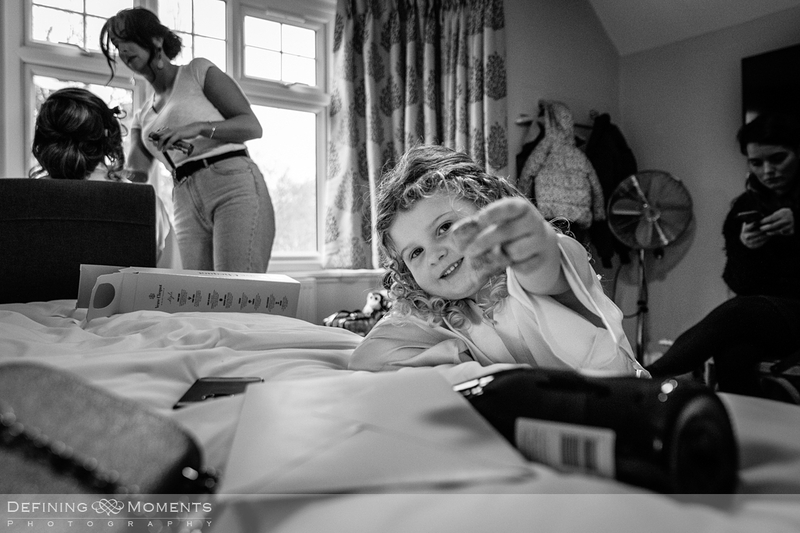 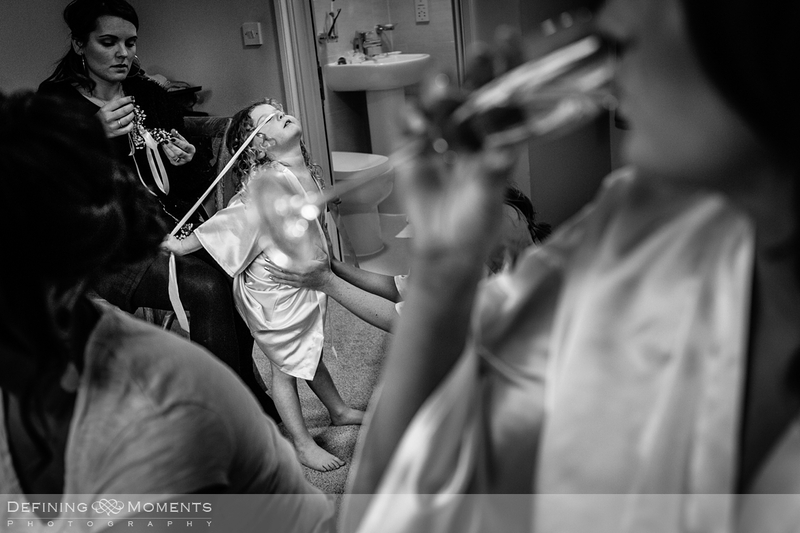 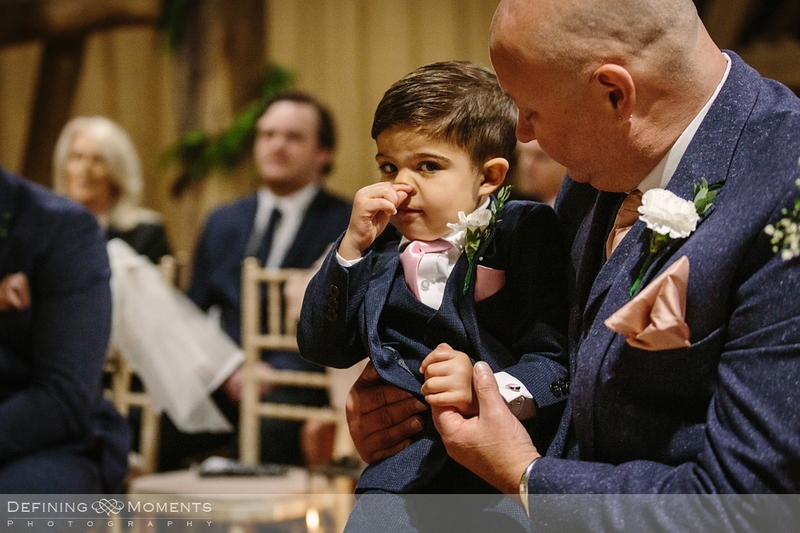 Fellow wedding photographer Jamie captured the groom’s & his best man’s preps, whilst I was with the bride & her wedding entourage, super-starring the couple’s gorgeous daughter and flower-girl for the day. 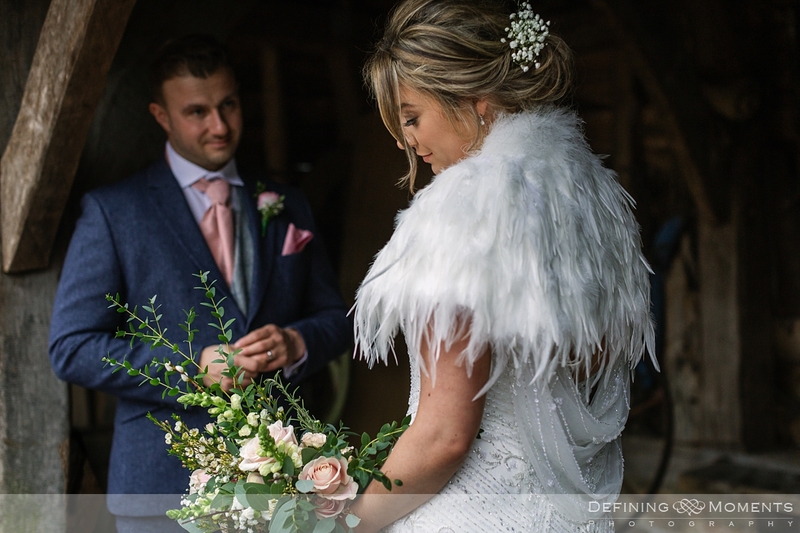 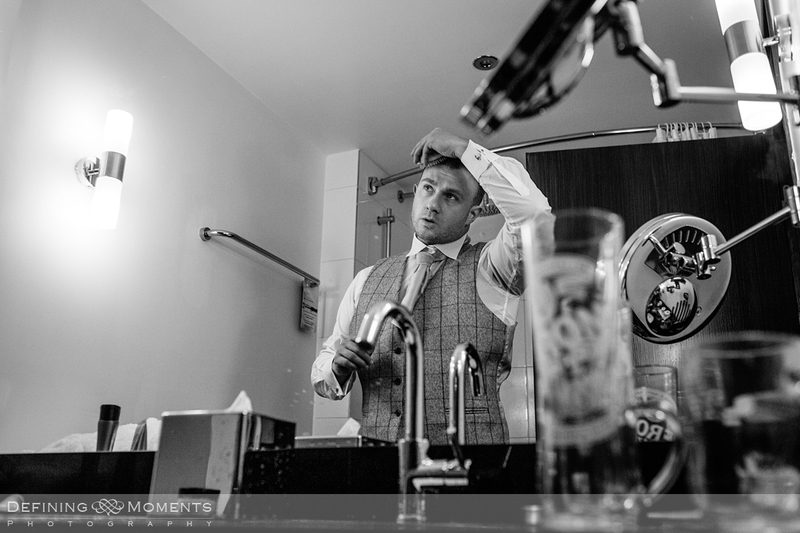 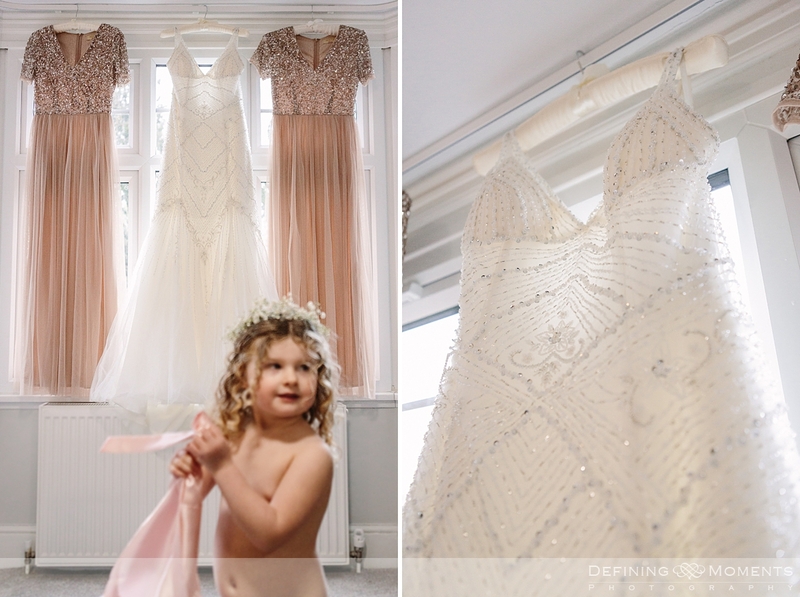 Scroll down to see the full documentary-style wedding reportage and read more about this wonderful day! 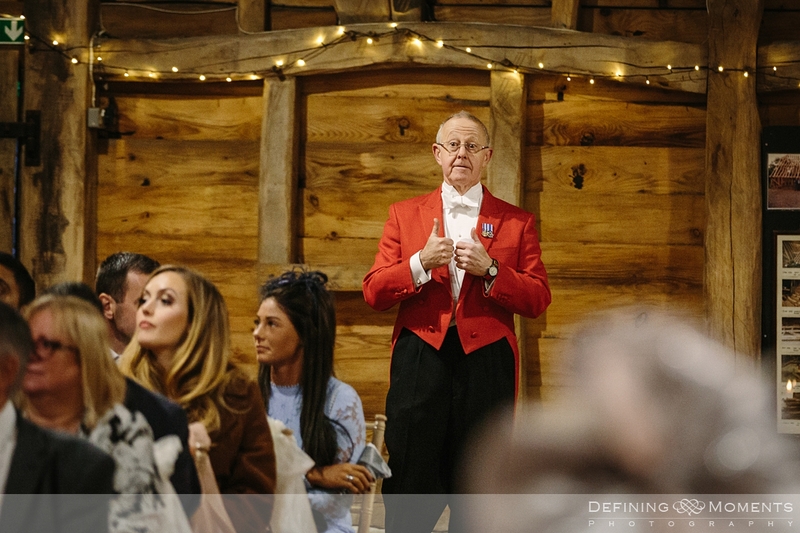 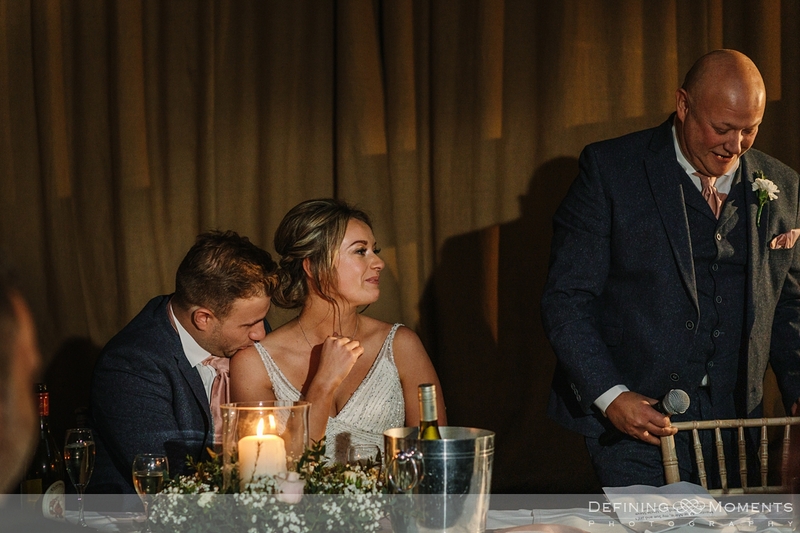 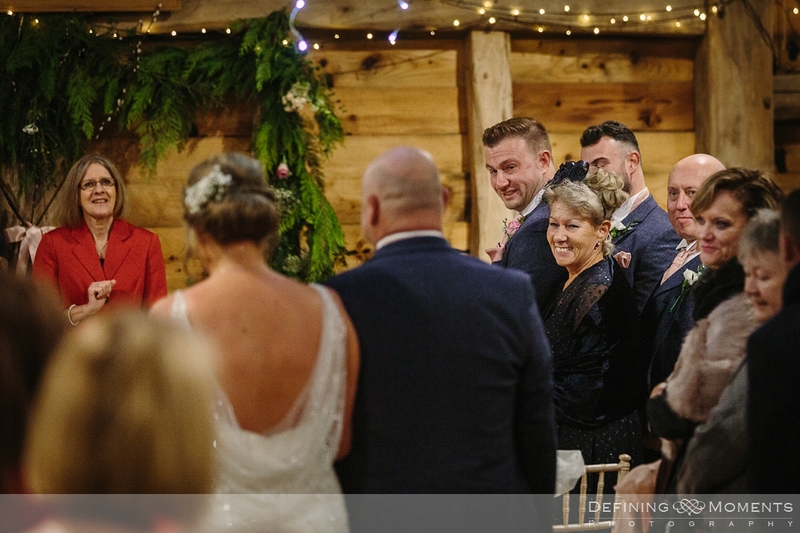 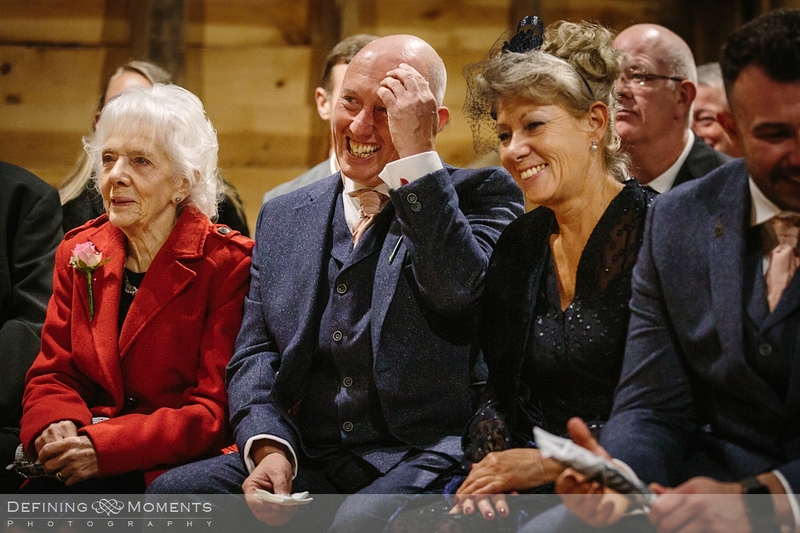 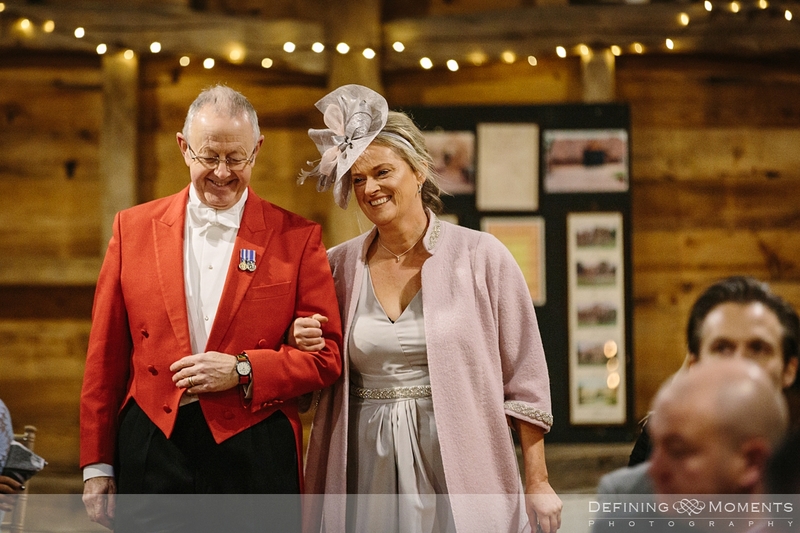 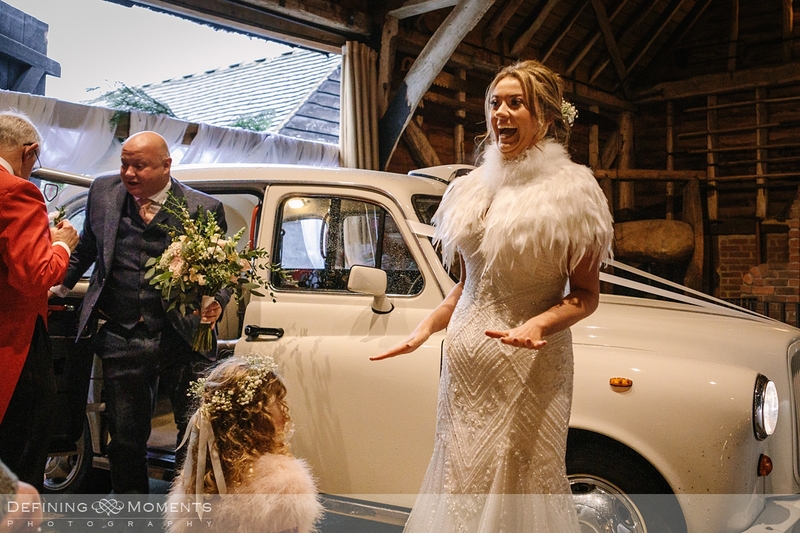 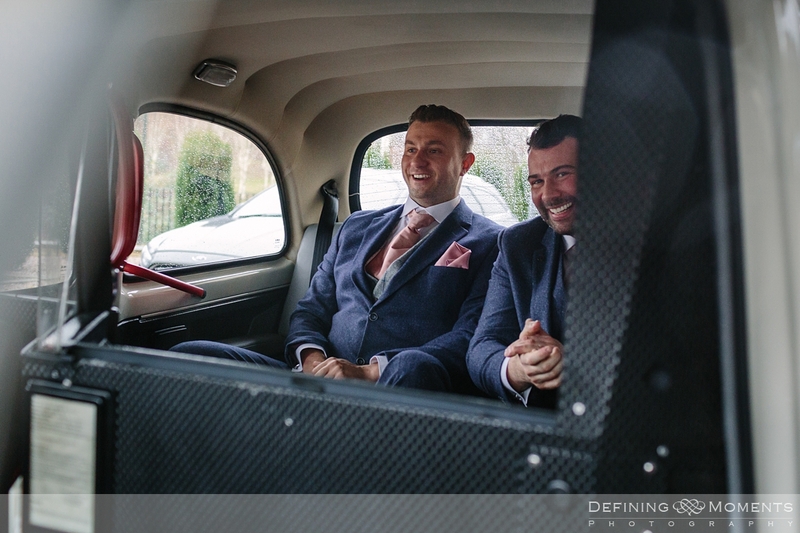 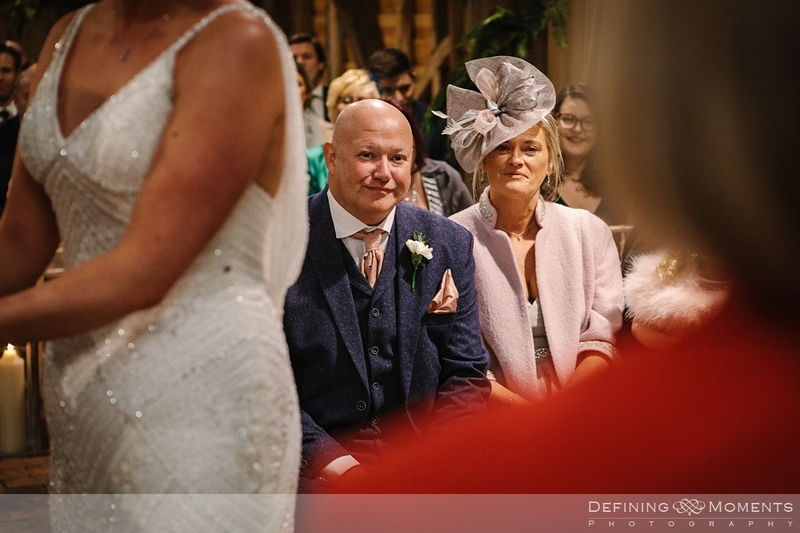 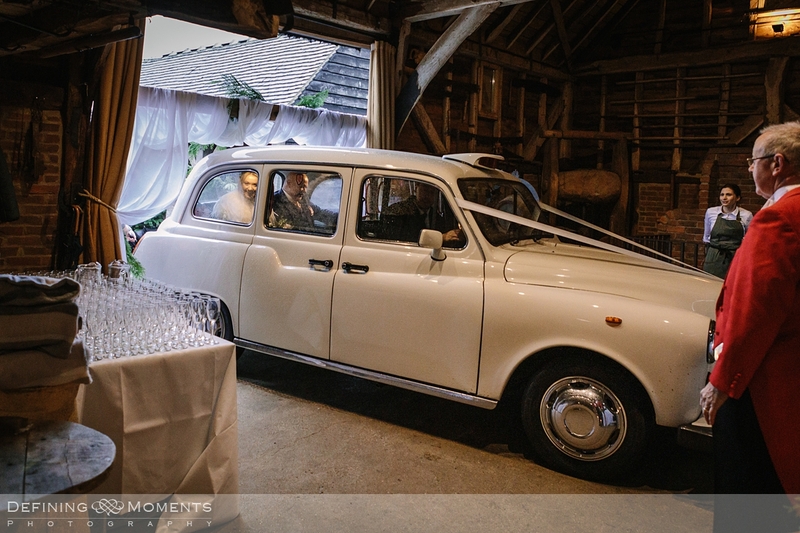 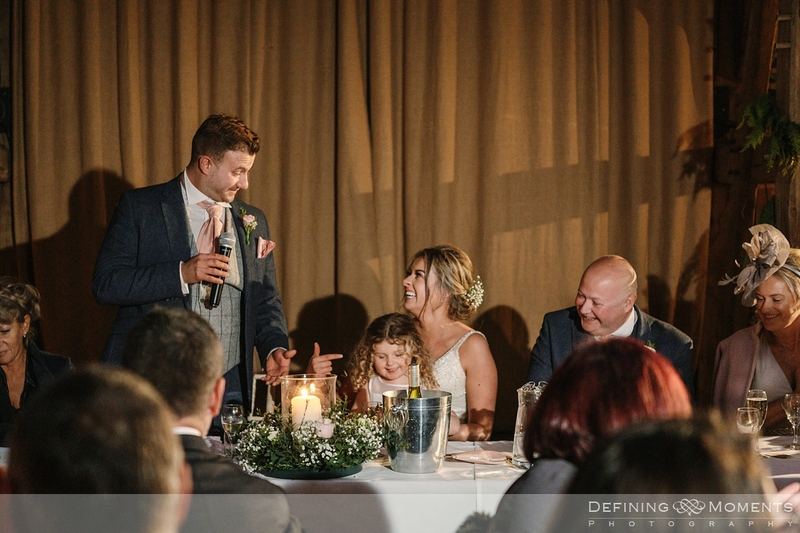 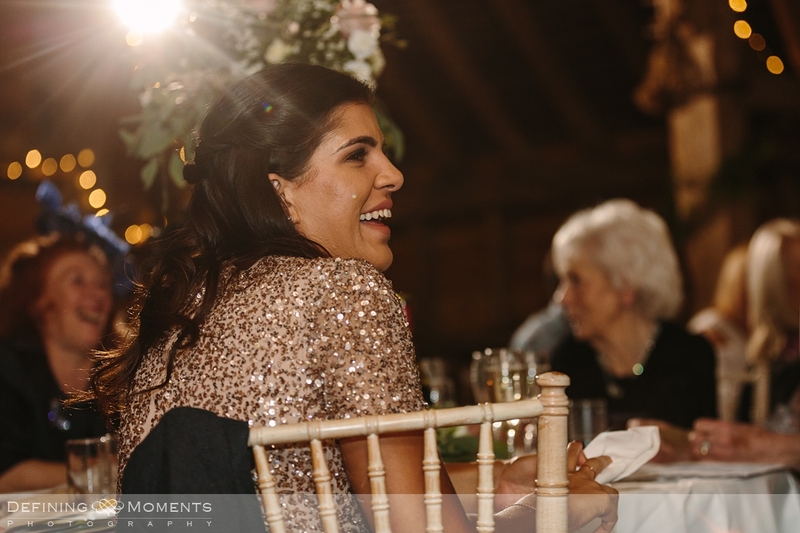 Not long after the preps, everyone was ready for the wedding ceremony and after being welcomed by the lovely Toastmaster Peter Thompson, the bride made her entrance at Gildings Barns in style with a vintage car, accompanied by her dad. 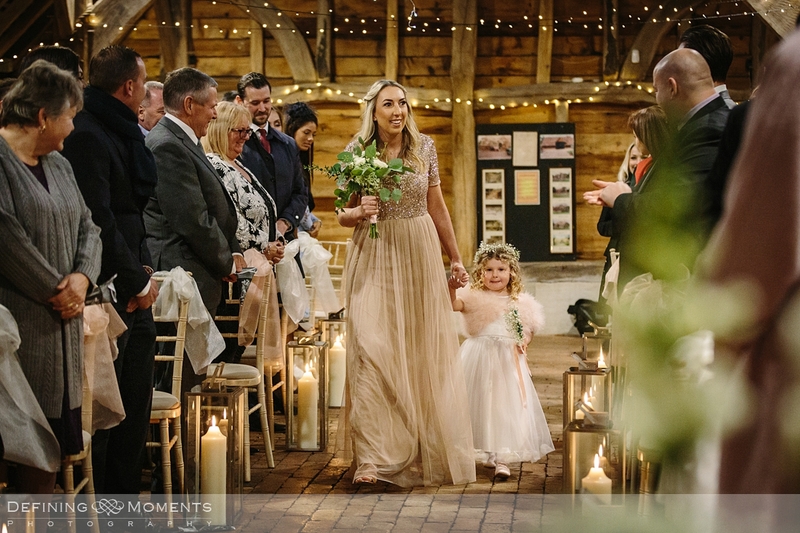 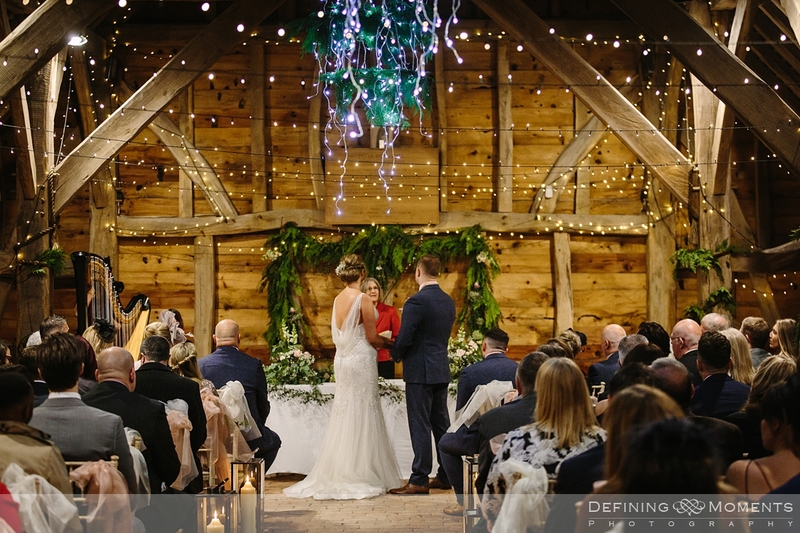 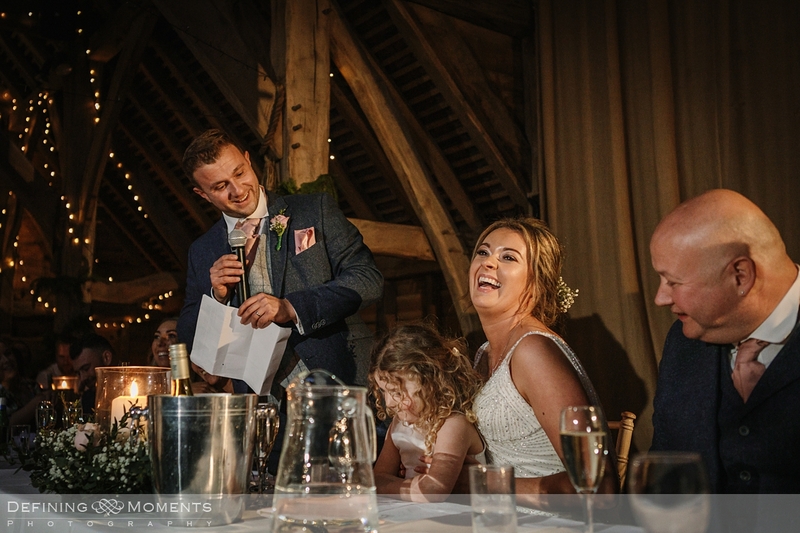 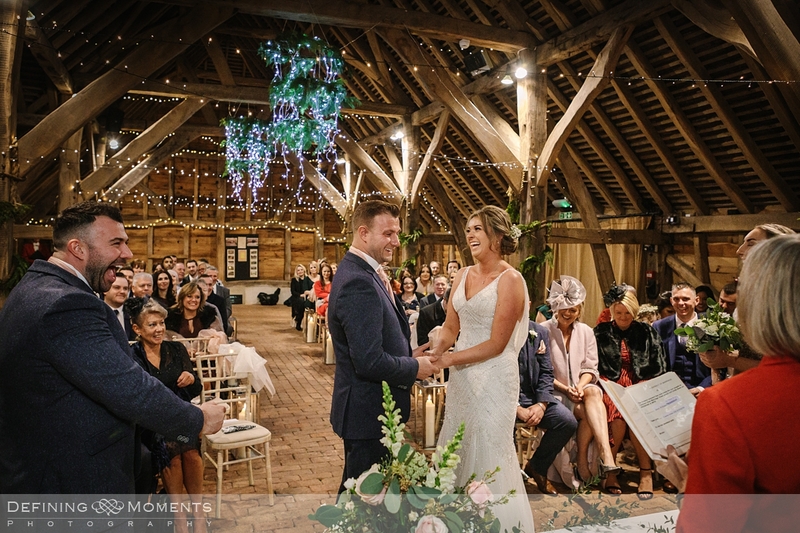 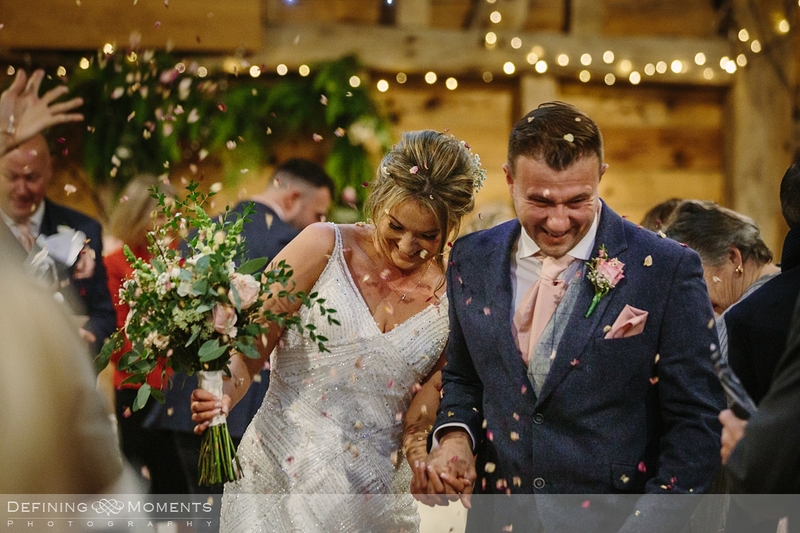 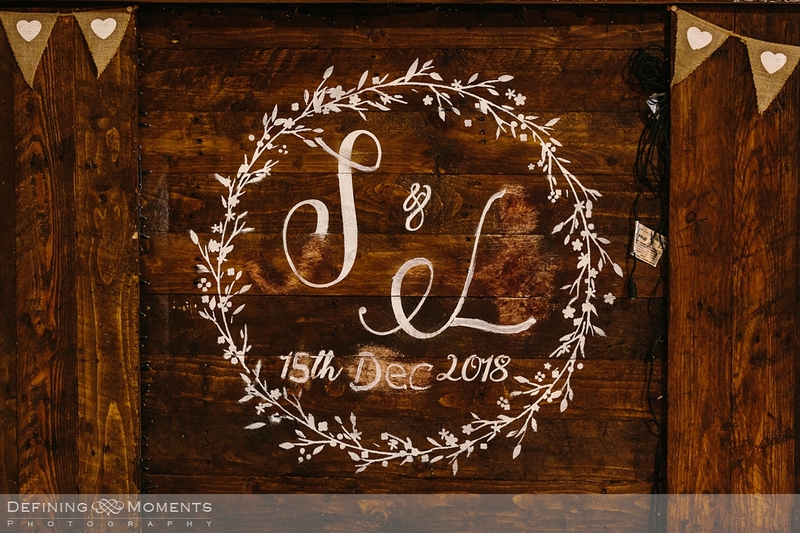 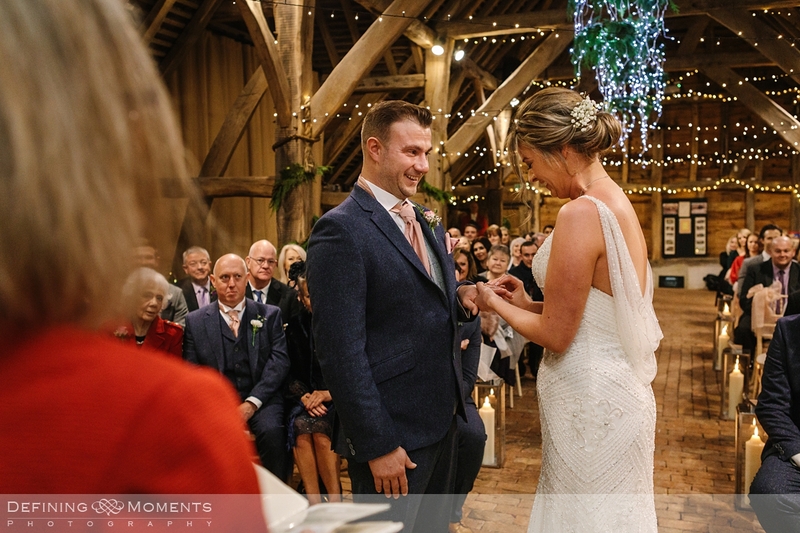 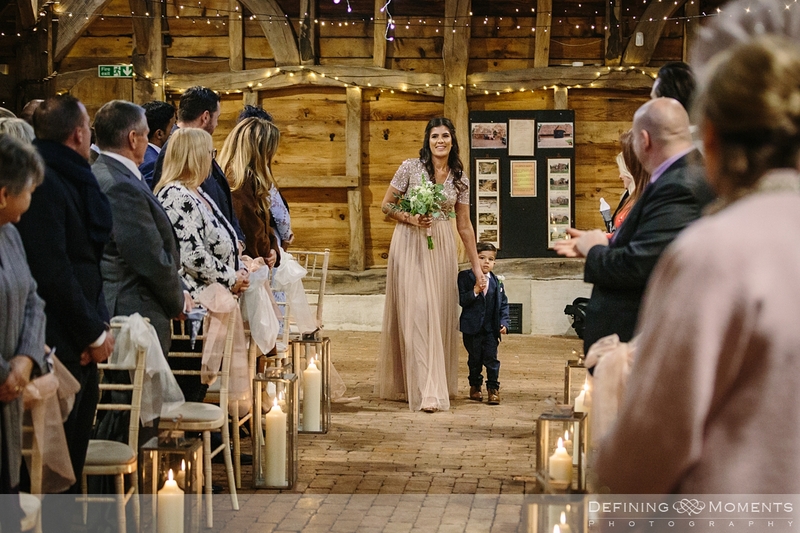 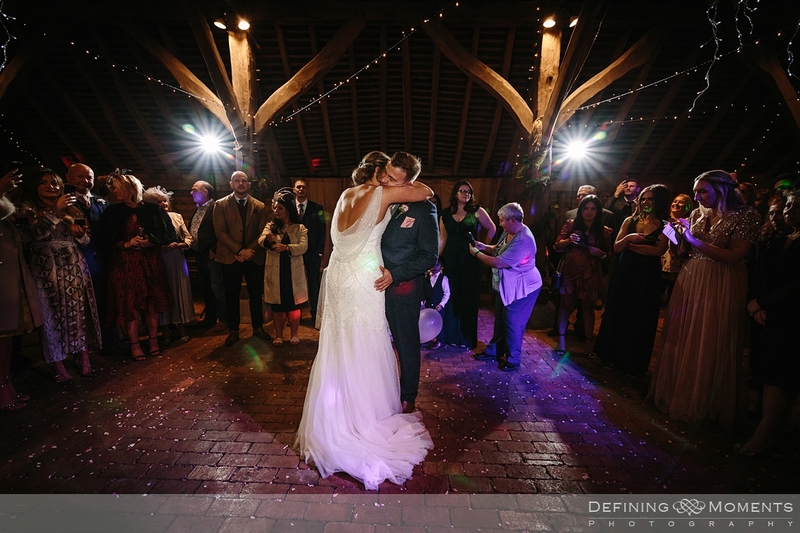 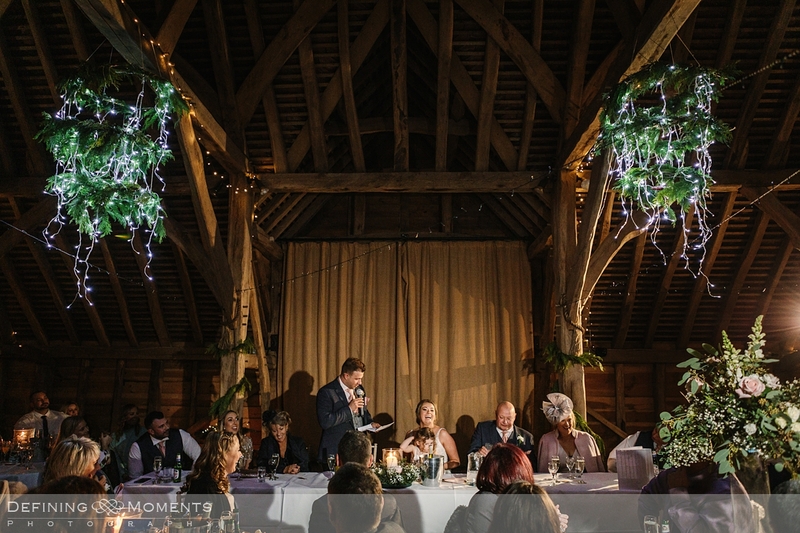 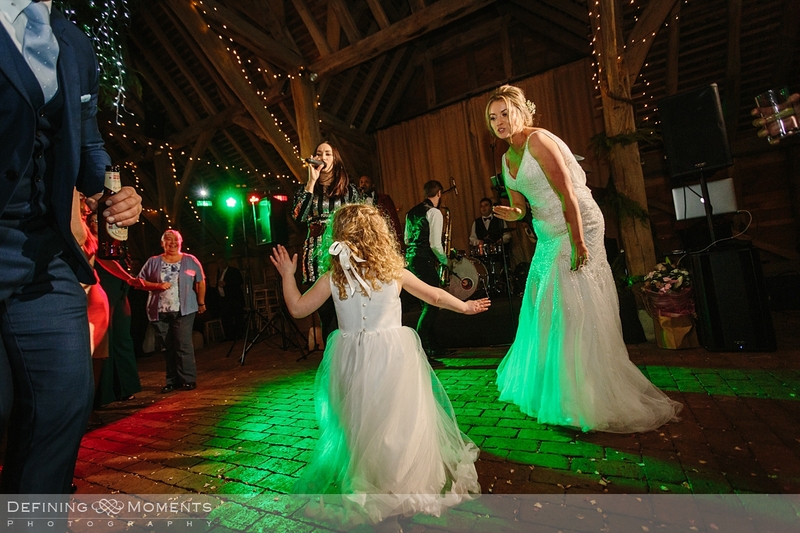 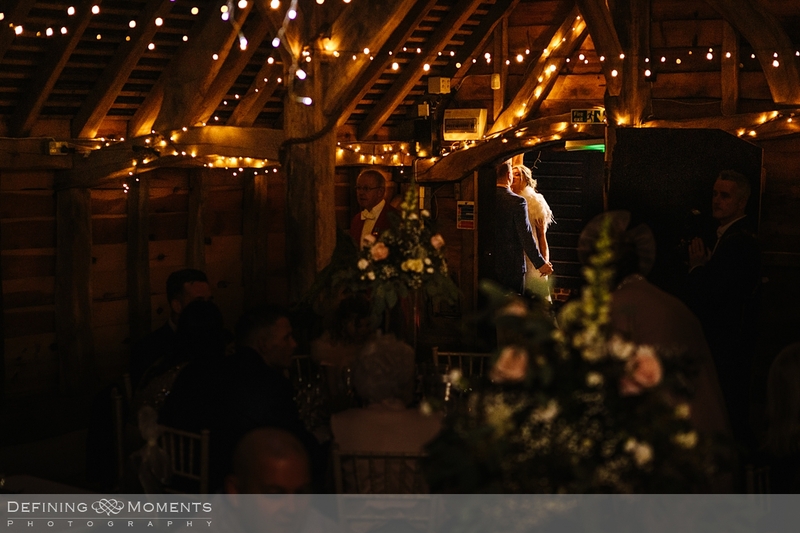 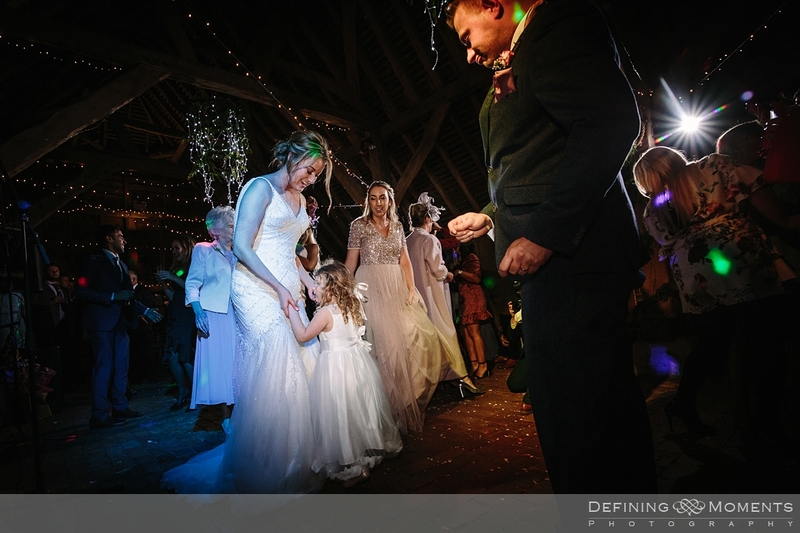 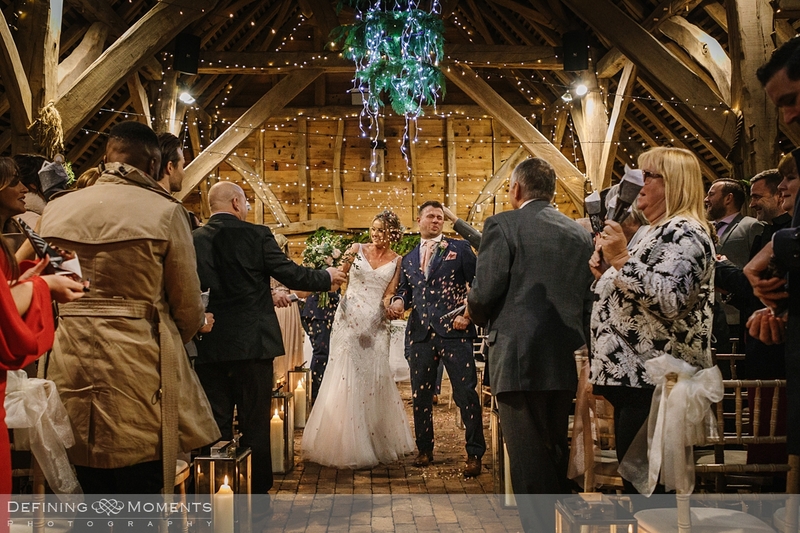 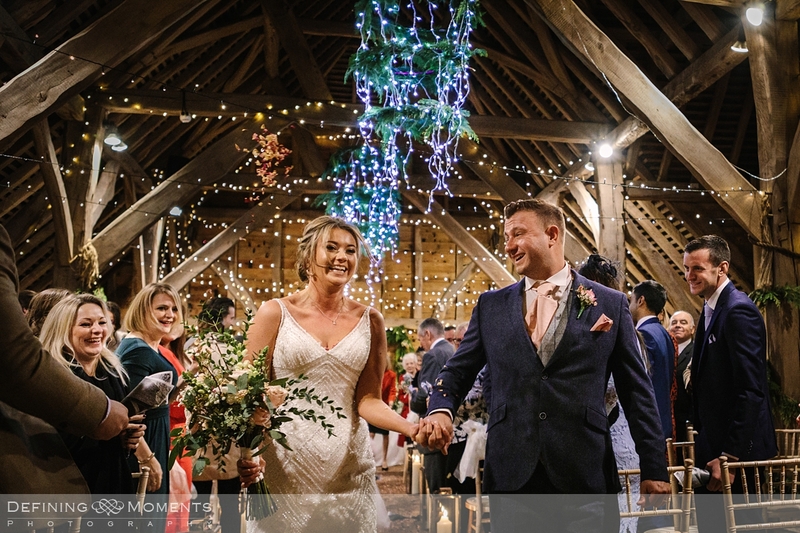 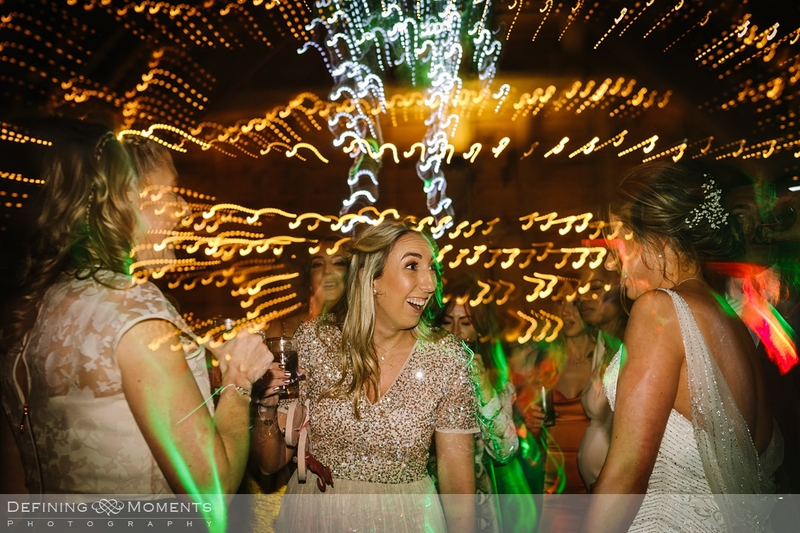 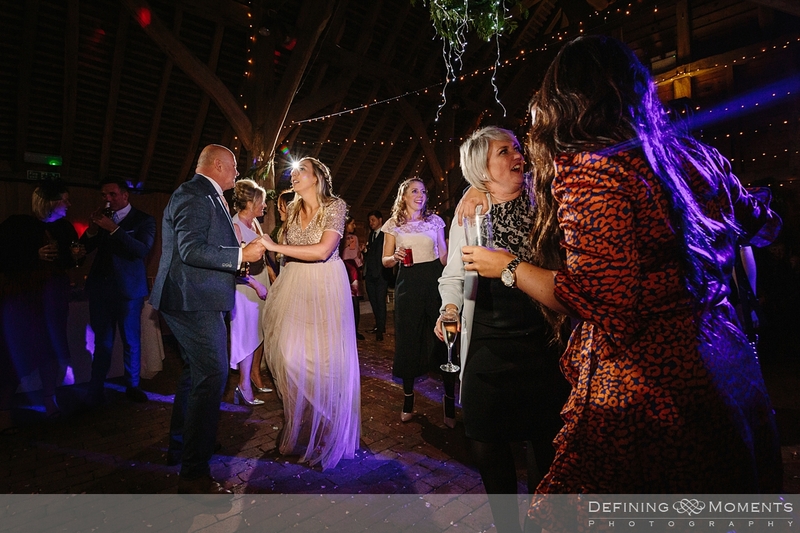 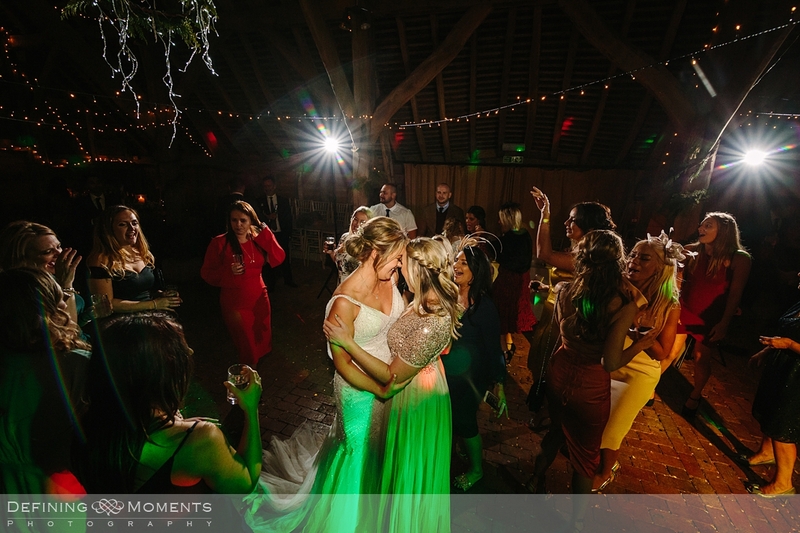 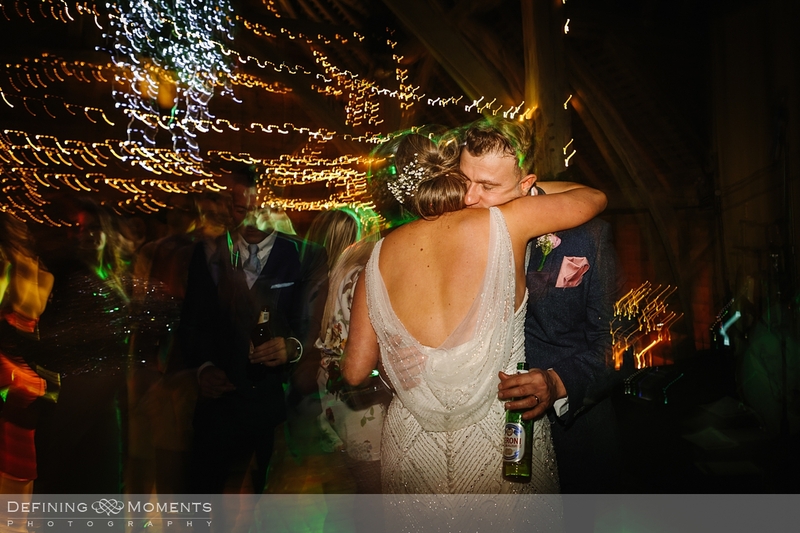 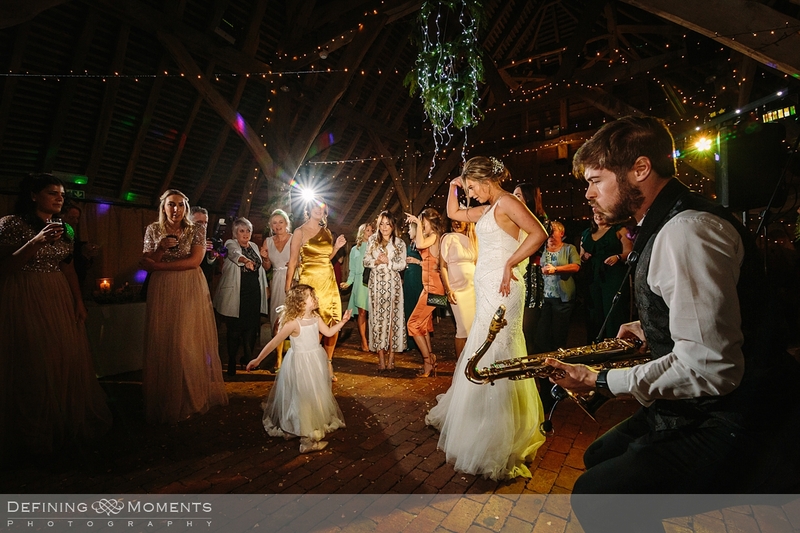 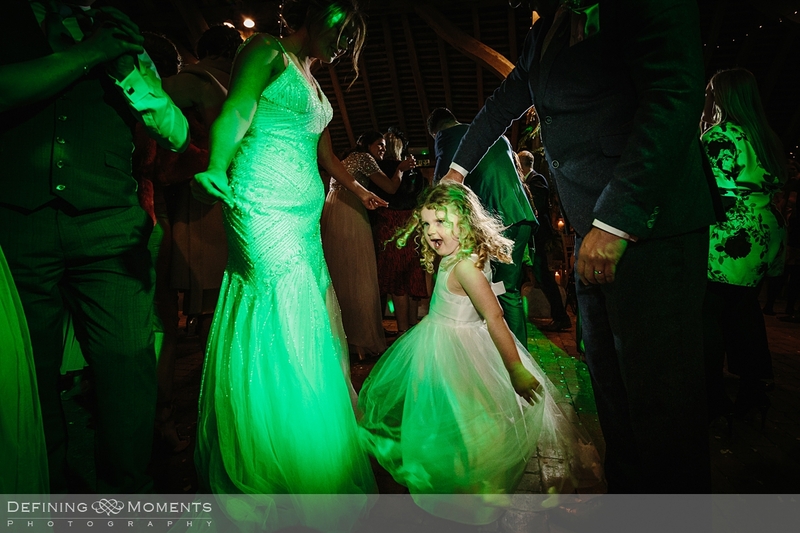 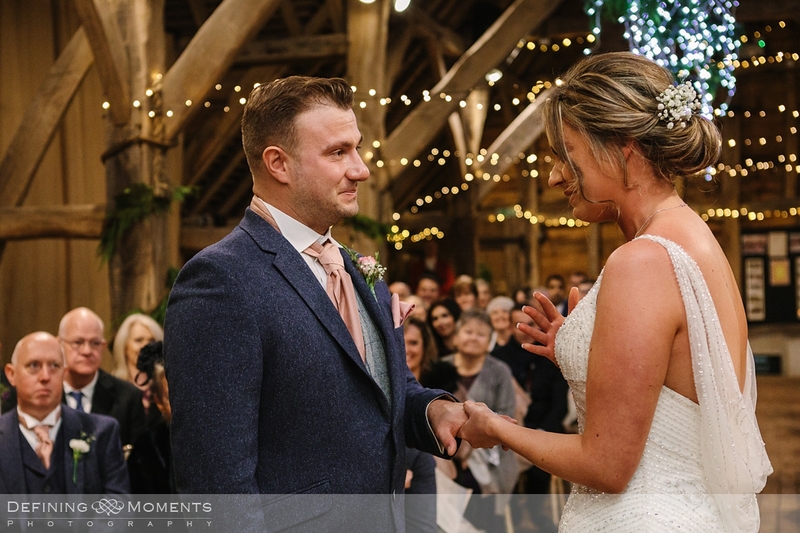 As it was mid-december, the main barn was beautifully decorated with a flood of fairy-lights that gave the space a warm, cosy and Christmassy feeling, the perfect setting for dad to walk his daughter down the isle. 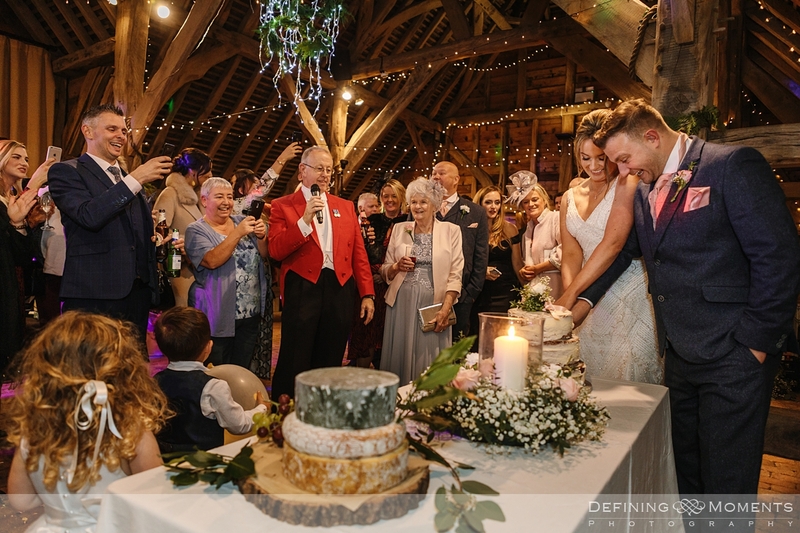 After the ceremony the newlyweds toasted with all family & friends present in the Threshing Barn, which houses a collection of vintage agricultural tools and equipment from the era in which it was built. 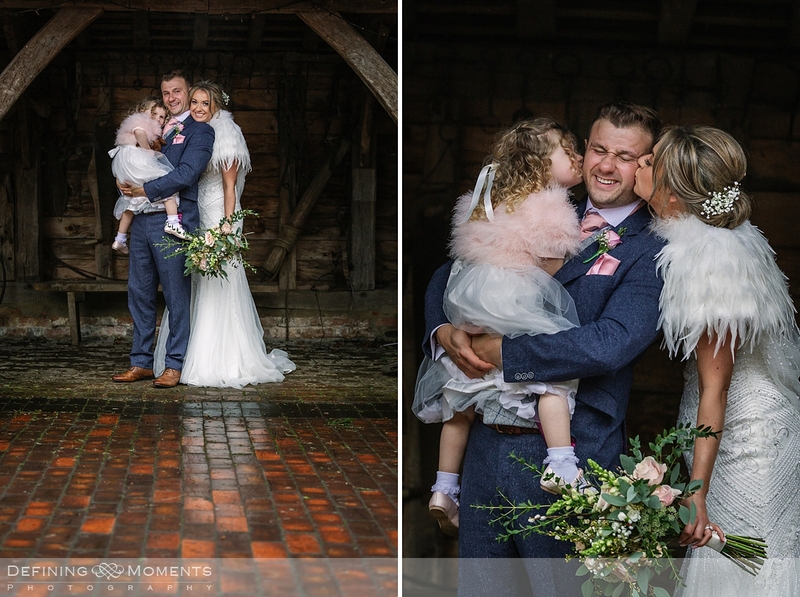 Of course we made time for some family formals and bride & groom portraits, all done under the hovel in the courtyard as it has started to rain relentlessly – but that didn’t stop us from getting some nice, authentic wedding portraits that fit in nicely with my documentary wedding photography style. 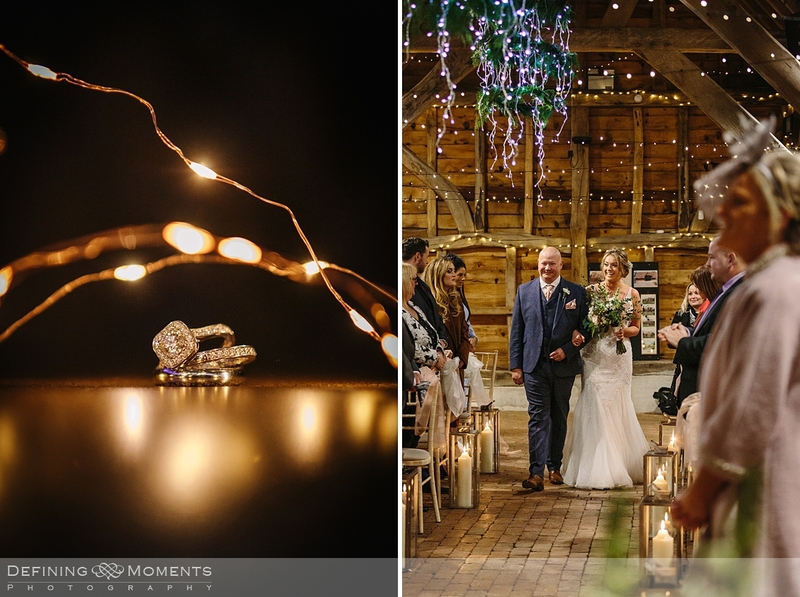 The afternoon concluded with a lovely wedding breakfast in the main barn, which had been transformed and was ever so cosy and oozed atmosphere from every corner, the perfect backdrop for some emotional speeches by the main gentlemen in the bride’s life… As the sun had set since a while and with very little artificial light indoors, we used our off-camera-flash techniques (aka OCF) to create light and ensure it also went where we wanted it ;-). 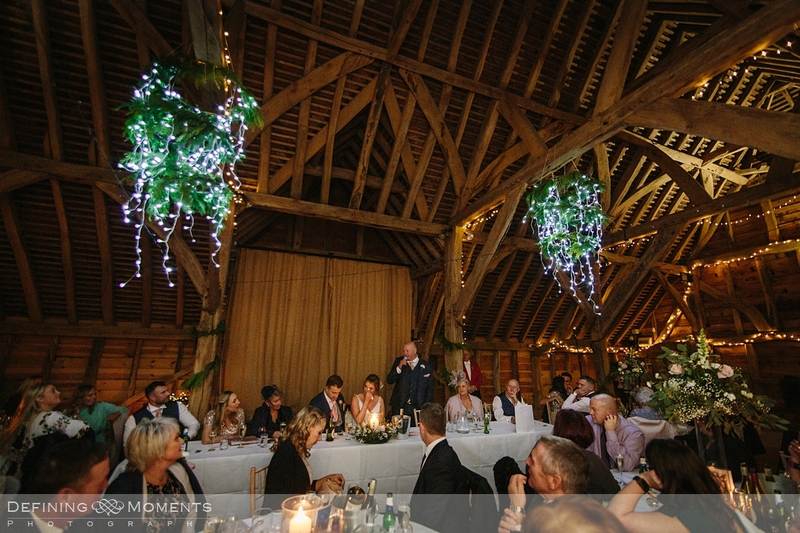 After the wedding breakfast the main barn was rapidly transformed again to make space for the wedding party, and what a party it was! 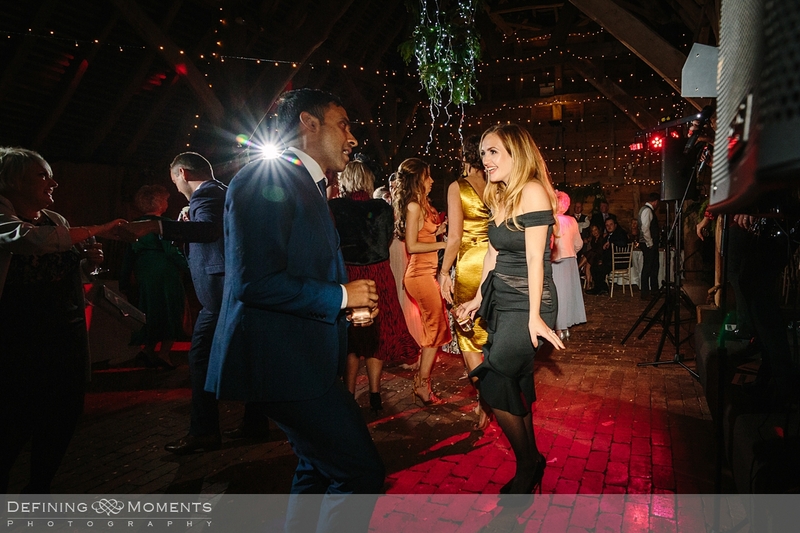 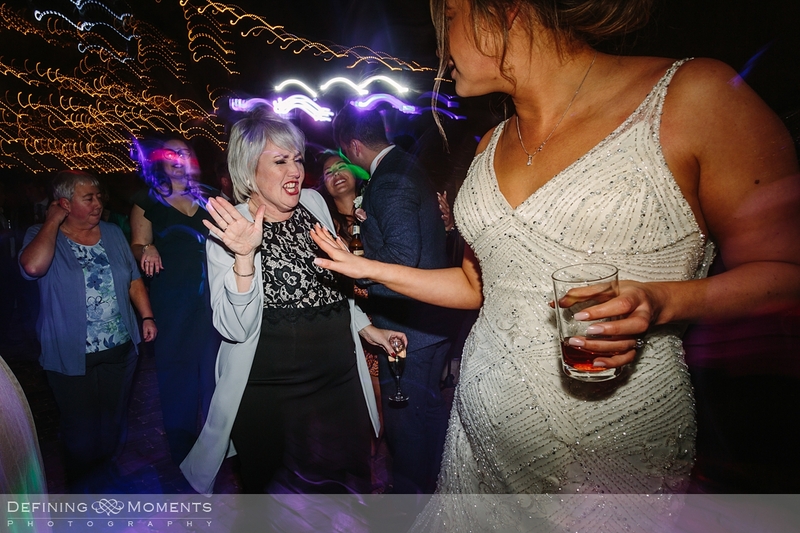 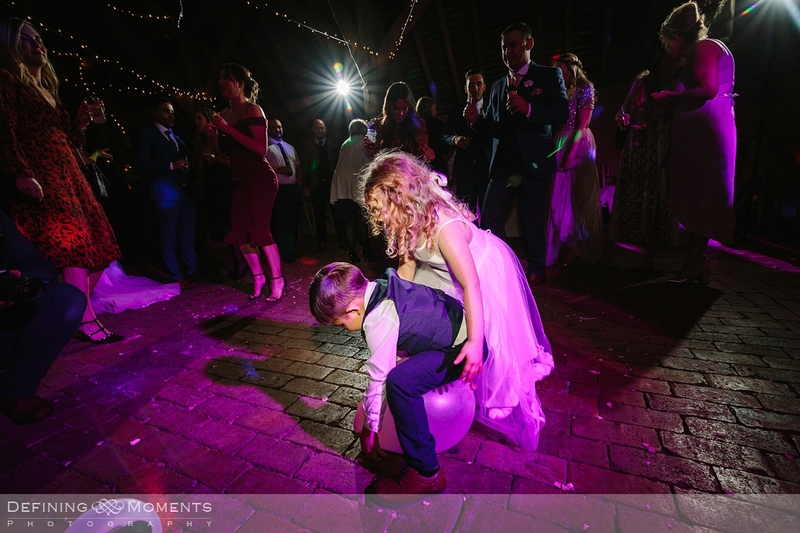 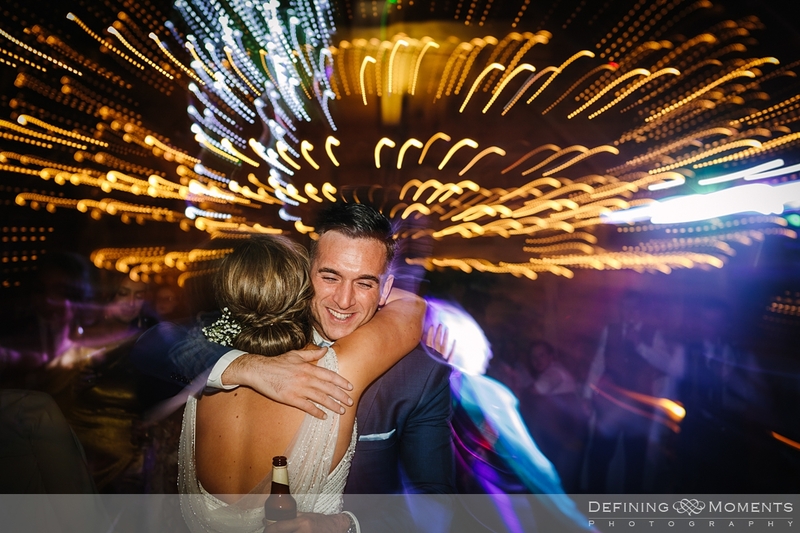 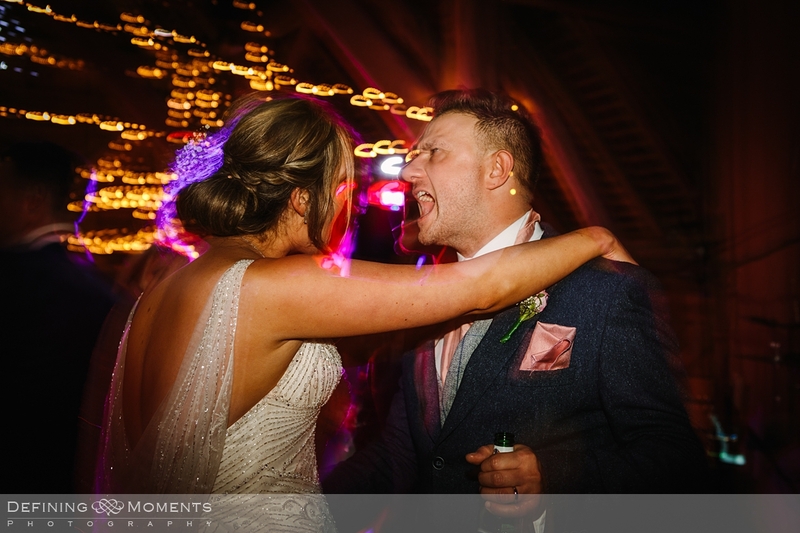 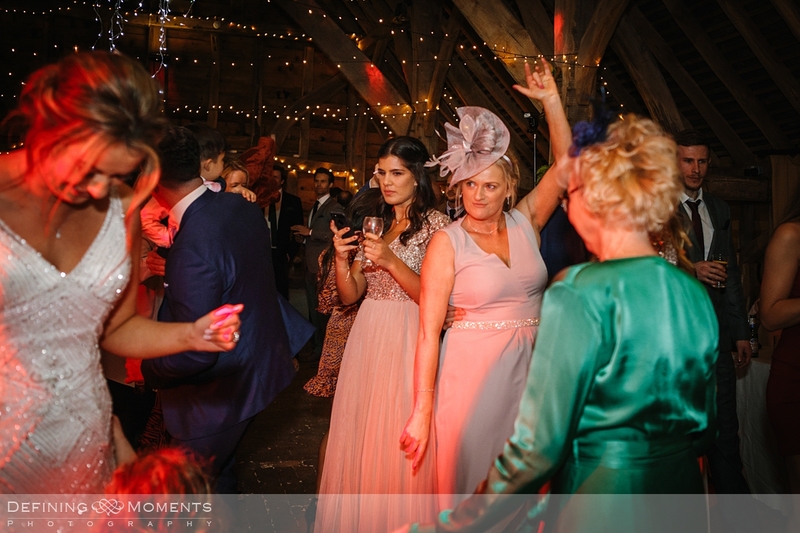 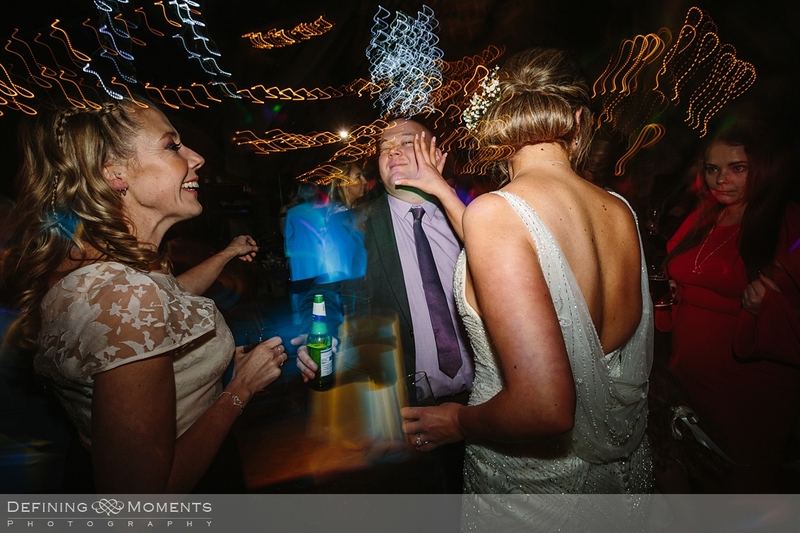 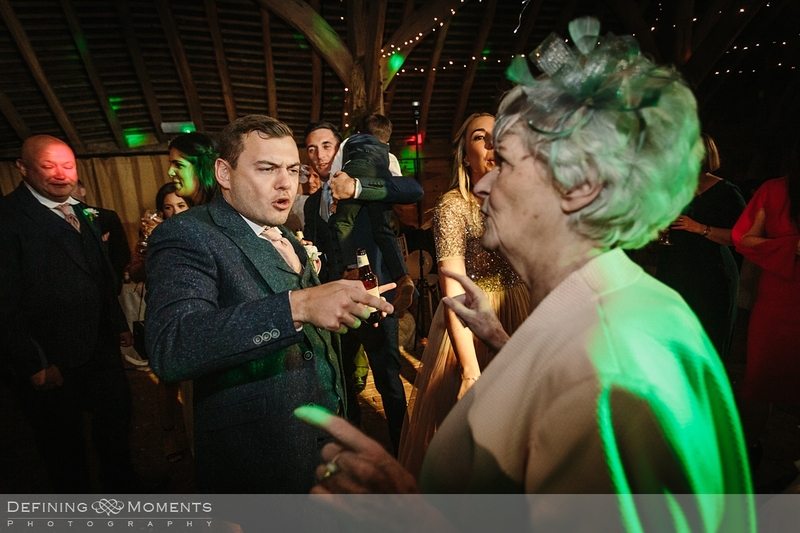 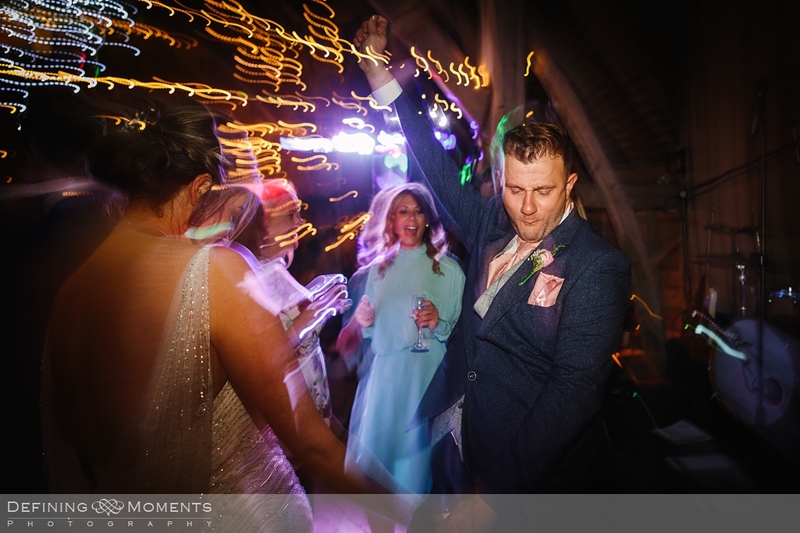 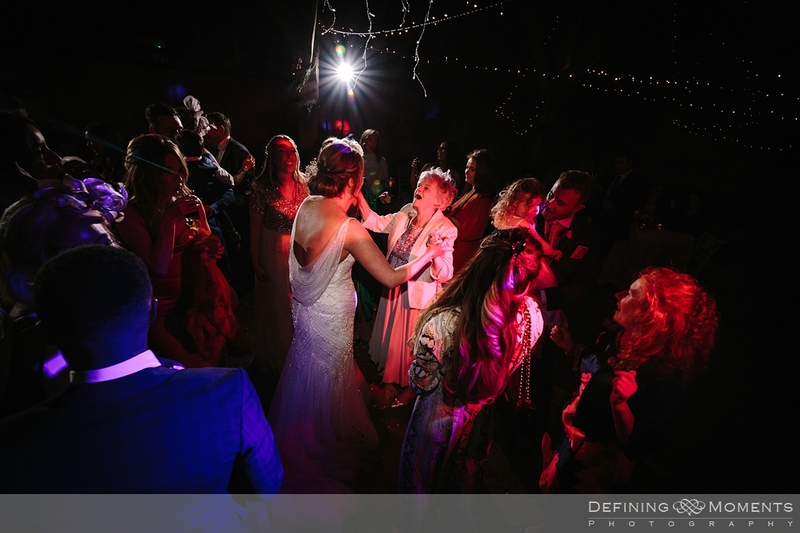 Everyone had a great time and it was a lot of fun capturing the dance-floor action with the same documentary style wedding photography approach, using ocf here as well, together with some special camera settings to capture some very creative wedding dance floor images. 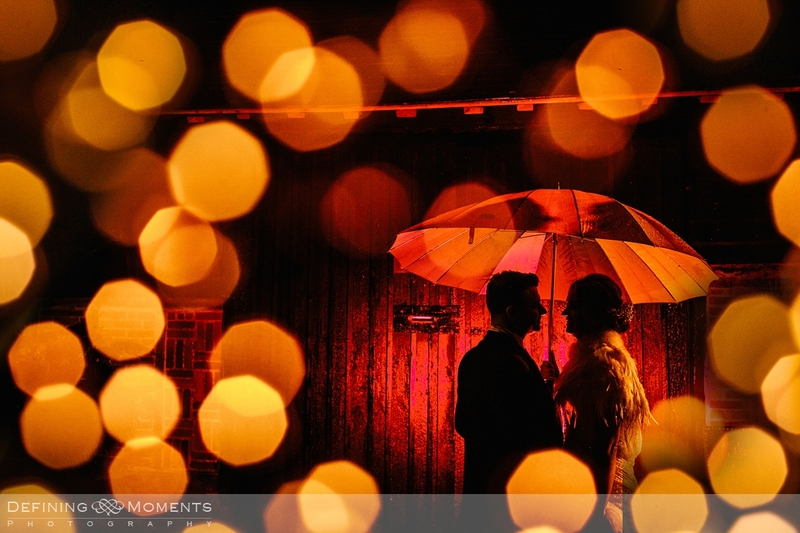 I especially love the last one of the day, which is a double-exposure of the ever present fairy lights framing the couple outside under an umbrella, back-lit with ocf and red filter to give that extra Christmassy feel ;-). 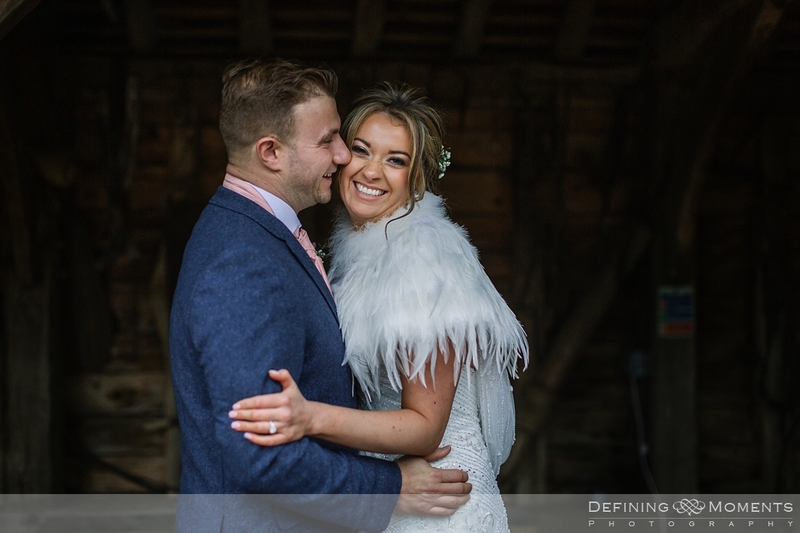 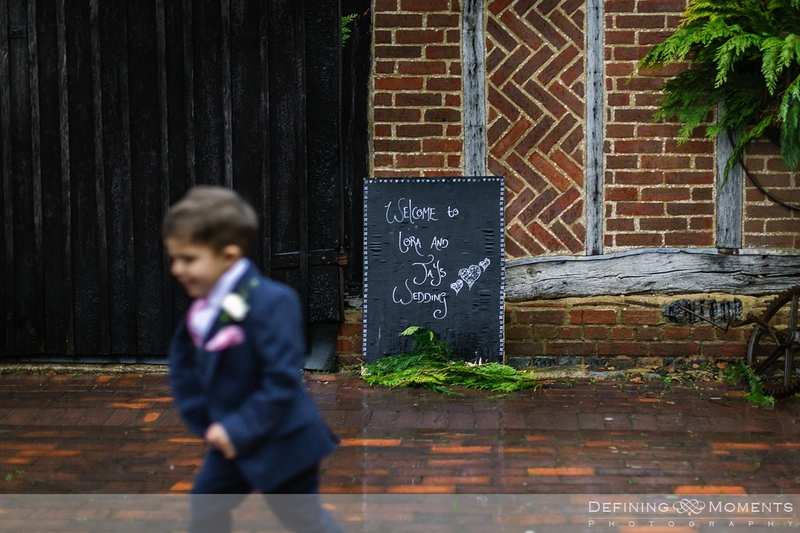 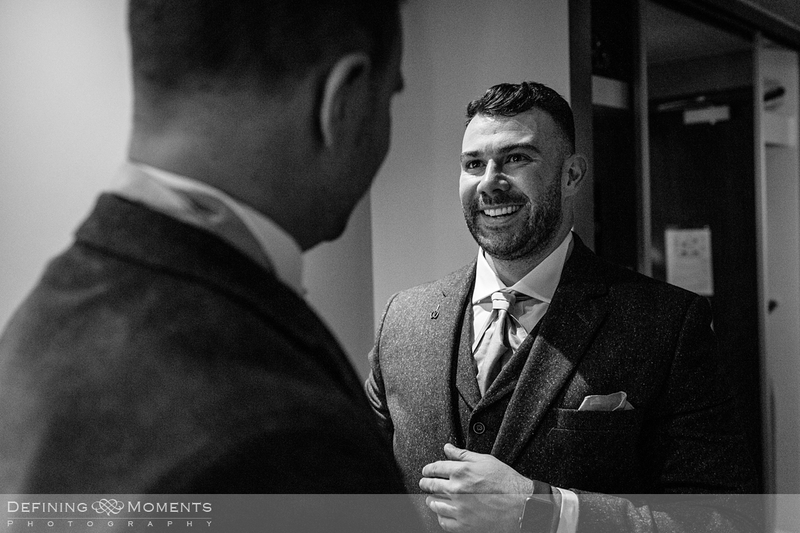 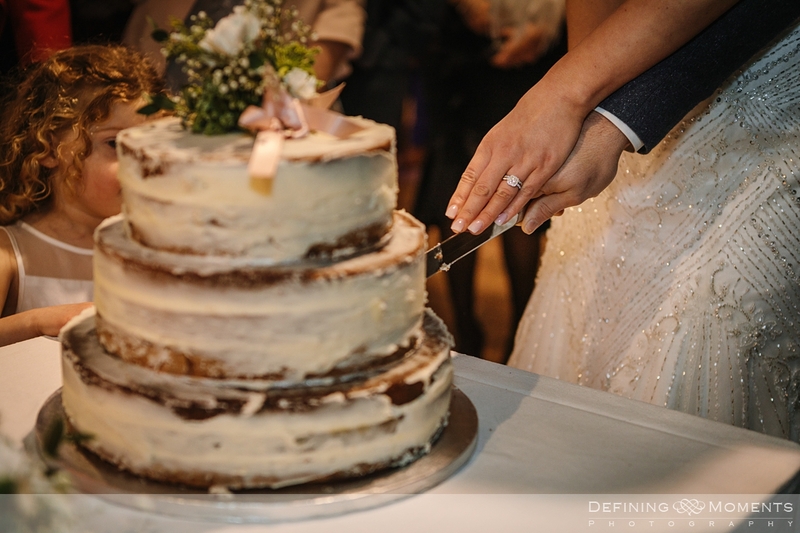 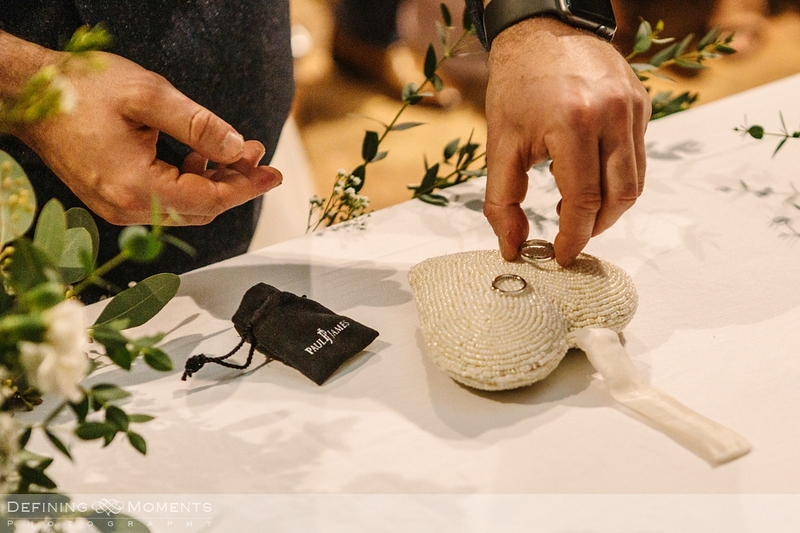 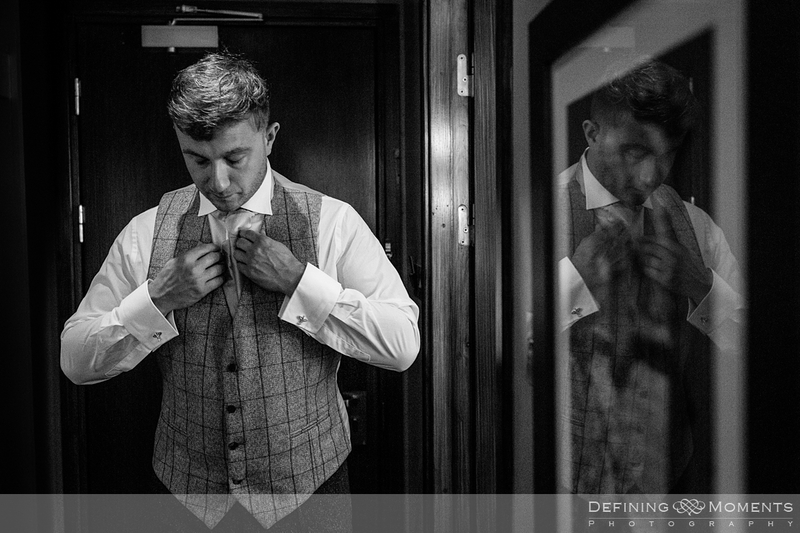 In short: this Gildings Barn wedding photography reportage was a true pleasure and an absolute privilege to capture for this documentary wedding photographer Surrey, so a big Thank You! 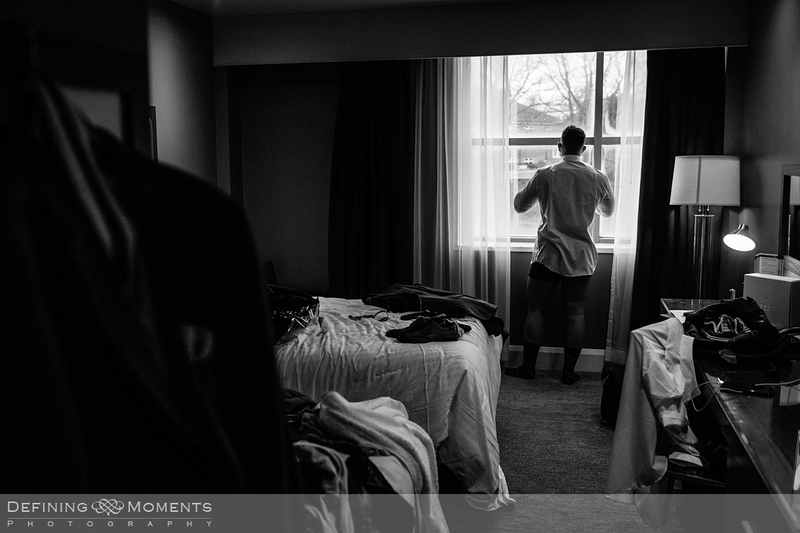 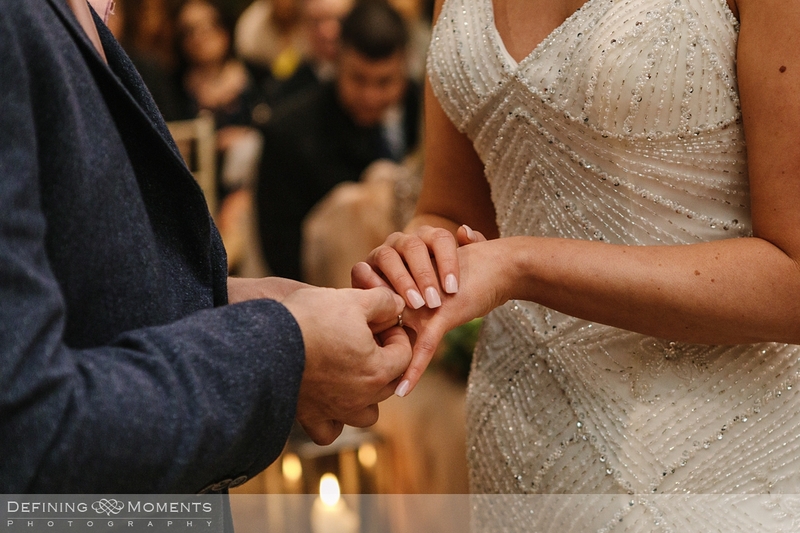 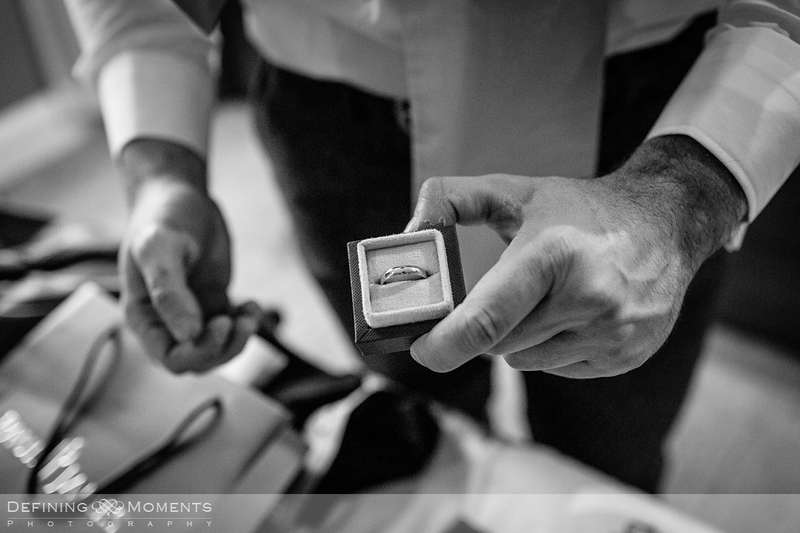 to Jason & Lora for trusting me with capturing their special day for them.